An Ordinary Meeting of the Bega Valley Shire Council will be held at Council Chambers, Bega on Wednesday, 22 May 2013 commencing at 2.00 pm to consider and resolve on the matters set out in the attached Agenda. That the Minutes of the Ordinary Meeting held on 1 May 2013 as circulated, be taken as read and confirmed. 12.3 Public Exhibition - Integrated Planning and Reporting - Community Strategic Plan 120 . The Australian Local Government Association and Local Government and Shires Association have been lobbying for Constitutional Recognition of Local Government for several years. 1. That Council contribute $19,612.65 plus GST over three years to the Australian Local Government Association (through the Local Government and Shires Association (LGSA)) to coordinate a national advertising campaign for constitutional recognition of local government. 2. That such funds be provided on the basis that, should the campaign not proceed due to opposition from State Government, those funds be reimbursed. Council has reaffirmed its commitment to the Constitutional Recognition of Local Government in July 2012 and January 2013. Advice has been received that the Prime Minister, the Hon Julia Gillard MP has announced the Government’s intention to proceed with a referendum on the financial recognition of local government in the Australian Constitution in conjunction with the 14 September 2013 Federal Election. Passing the referendum to allow the Commonwealth Government to provide funds directly to local councils for their communities will remove the legal uncertainty about the Roads to Recovery program and ensure that this program and other programs where the Commonwealth provides funding directly to local government will be able to continue. It will enshrine in the Constitution the ability of the Commonwealth Government to provide funding directly to communities where it believes this is in the national interest, and formalise programs such as Roads to Recovery, which have been directly funded for over a decade. • The referendum seeks to continue what we already thought was the case- that the Federal Government should be able to provide funding for vital local community services and infrastructure directly through councils. • The change being proposed is a simple pragmatic change to address a problem which has arisen over the last few years. • It won't change the status of local government, or its powers, or its relationship with the state government. It will however, remove the legal uncertainty about the Federal Government's ability to fund local communities directly through their councils; uncertainty created by two High Court cases -the Pape Case and the Williams Case - in the last couple of years. • The Federal Government has been funding vital community services and infrastructure through programs like Roads to Recovery and the Regional and Local Community Infrastructure Program for more than a decade. Billions of dollars have been invested in tens of thousands of local community projects covering roads, footpaths and bridges, community halls, ovals, childcare centres, swimming pools, etc. Local communities deserve that support and this is what the referendum is all about. • The referendum will formalise what has already been happening for more than ten years. • Direct Federal funding is important because the Federal Government collects more than 80% of all tax revenue in Australia. This was not the case when the Constitution was written. We need a relatively small change to the Constitution to take account of today's circumstances. The local services and infrastructure we are talking about cannot be funded by the State Governments because they don't have the revenue. That Council reaffirm its support for financial recognition of Local Government in the Australian Constitution. Council is in receipt of a Section 96 Application to Modify Development Consent 1999.1438 issued for a Clay Target Shooting Range. The application seeks to modify Condition 4 to permit one additional shoot day per month for training purposes. This application is being reported to Council for determination as 18 submissions have been received objecting to the proposed modification to Condition 4. The application for modification is recommended for approval subject to the attached draft modified consent. 1. Development shall take place in accordance with the Approved development Plan, except as modified by the following conditions. 2. This consent is for a trial period of 12 months from the date of commencement of this consent and will be reviewed in light of operation of the use during that time. 3. All requirements of Environmental Protection Authority shall be complied with prior to commencement of the use. A copy of the EPA approval shall be submitted to Council prior to commencement of the use. 4. All requirements of the NSW Police shall be complied with prior to commencement of the use and a copy of their letter shall be submitted to Council. 5. Toilet facilities shall be provided to the requirements of Council’s Environmental Health and Building Surveyor. 6. The use shall be restricted to one day every second weekend (between the hours of 10.00am and 5.00pm) in any one calendar year unless otherwise approved by Council. 7. No trees shall be removed without the approval of Council. 8. Public access to the site shall be restricted to the requirements of NSW Police Service. 9. No consumption of alcohol shall take place during the target day shooting use. 10. Signs shall be erected prohibiting public access. 11. Shooting shall only take place when supervisors approved by NSW Police Service are on site. 12. No commercial advertising signs shall be erected, painted or displayed. At the end of the trial period the use was not reviewed and accordingly the consent lapsed. Development application No. 1999.1438 was lodged with Council on 21 June 1999 for a Clay Target Shooting Range. 1. The development consent shall operate for a trial period, which will cease on 28 February 2000 and will be reviewed in the light of the operation of the use at that time with development Consent no. 97.1328. 2. Compliance with Conditions of development Consent No 97.1328 dated 26 May 1998, except for Condition 2, previously issued. 3. (i) that Council staff carry out appropriate noise tests on the days of normal clay target shooting range use to determine the noise impact on the surrounding locality. (ii) the applicant must give a minimum of seven (7) days notice to Council staff in relation to the days that each clay target range shoot is to happen. 4. That a further report be submitted to Council at the expiration of the trial period on the 28 February 2000. 5. That adjoining and adjacent residents and objectors be notified of council’s decision. 6. That in the circumstances of this case, no fee be charged for DA 99.1438. Noise tests were undertaken by Council staff on 19 September 1999 and a further report submitted to Council. On 14 December 1999 Council resolved that for the development to operate beyond 28 February 2000, the applicant was required to provide an independent acoustic assessment carried out by a suitably qualified and practising acoustic consultant at the applicant’s expense and for a Section 96 Application to Modify to be lodged. On 16 February 2000, the applicant lodged a Section 96 Application to Modify which was accompanied by a Noise Impact Assessment provided by Renzo Tonin & Associates Pty Ltd (consultants in Acoustics, Vibration and Structural Dynamics). The Section 96 Application sought approval for the deletion of Condition 1 being the 6 month trial period and for the development to continue. The Section 96 Application was notified with a number of submissions received objecting to the development. 2. All requirements of NSW Police shall be complied with prior to commencement of the use and a copy of their letter of approval shall be submitted to Council. 3. Toilet facilities shall be provided to the requirements of Council’s Environmental Health and Building Surveyor. 4. The use shall be restricted to a maximum of 12 days (between the hours of 10.00am and 5.00pm) in any one calendar year unless otherwise approved by Council. There shall not be less than 20 days between any event. 5. No trees shall be removed without the approval of Council. 6. 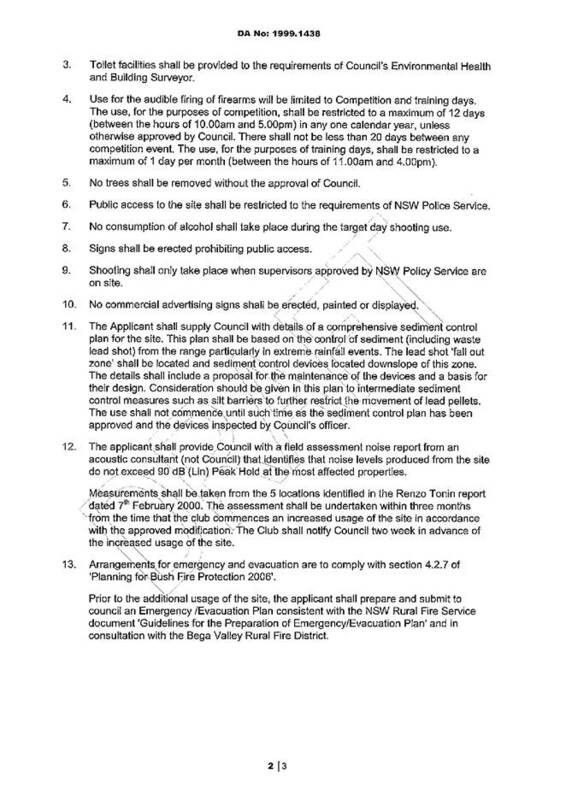 Public access to the site shall be restricted to the requirements of NSW Police Service. 7. No consumption of alcohol shall take place during the target day shooting use. 8. Signs shall be erected prohibiting public access. 9. Shooting shall only take place when supervisors approved by NSW Police Service are on site. 10. No commercial advertising signs shall be erected, painted or displayed. The matter was deferred and reconsidered at the Council (Administrator) meeting of 22 August 2000. The Section 96 Application to modify was approved in accordance with the staff recommendation to the 25 July 2000 Council meeting. A further report was provided to Council on the 18 December 2001 outlining further noise monitoring of the site undertaken by Council staff. 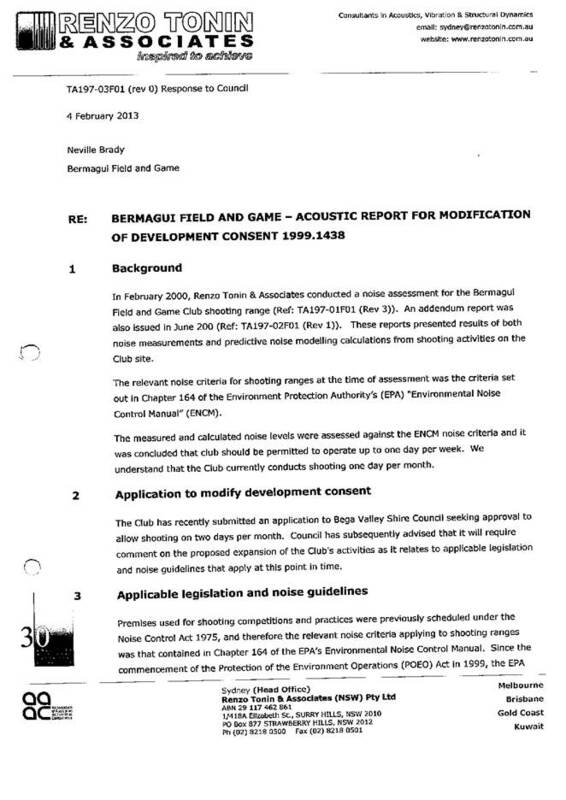 That report advised that the noise monitoring undertaken confirmed that the Bermagui Game and Field Association was operating in compliance with the conditions of consent and the provisions of the EPA guidelines. The applicant lodged the current Section 96 Application to Modify on 27 August 2012 seeking to modify Condition 4 to permit one training day per month. The application was re-notified in accordance with Development Control Plan No 3 – Notification Policy. Submissions were received in respect to the application and are discussed in this report. The applicant has lodged a Section 96 Application to modify Condition 4 of the consent. The application is sought to allow one training day per month, which would be the second Saturday of each month, between the hours of 11am and 4pm. The Club advises that it would enable them to conduct skills training, junior development, safety training, an introduction to firearms for new shooters and Firearms Licence Tests. The applicant has detailed that the increased days would not be used for competition and the number of shots fired would be in the region of 1-3% of a competition day. In support of the request the applicant provided additional information from noise consultants Renzo Tonin. The site occupies an area of 24.6 hectares that is well vegetated with access through State Forest land via Murrah River Road. The site is described as hilly with a small ridgeline traversing the site in a north-south direction. The site retains a number of free standing structures including shipping containers that accommodate the storage needs of the Club. The proposal has been assessed in accordance with the Matters for Consideration under Section 96 and Section 79C of the Environmental Planning Assessment Act 1979. A full assessment is provided in the S96 and S79C checklist attached to the DA file and available at the meeting. A Clay Target Shooting Range falls within the definition of a recreation area under Bega Valley Local Environmental Plan 2002 which is a permitted use within the Rural 1(a) zoning of the land subject to consent. The land is proposed to be zoned RU2 – Rural Landscape under the draft BVLEP 2013 with a Recreation Facility (Outdoor) permitted subject to development consent. A review of the development in accordance with the aims and objectives of the RU2 zoning has been undertaken. The assessment identified that the proposed development would be consistent with the aims and objectives of the zone as well as other relevant clauses of the draft plan. The applicant provided additional information from Renzo Tonin noise consultants addressing the noise impact of the proposed additional training day each month. 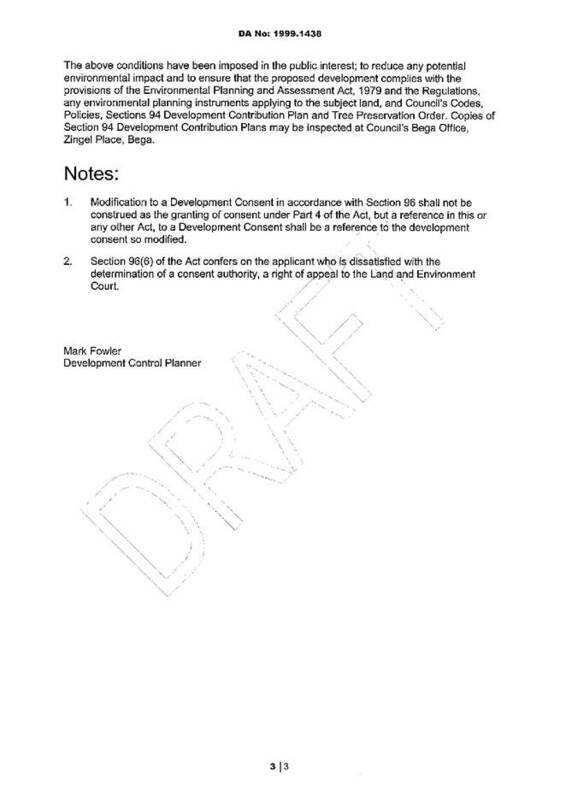 A copy of the noise consultant’s comments is included as Appendix 3. The consultant has advised that the original report prepared in February 2000 concluded that shooting would be permissible up to one day per week according to the EPA noise criteria. Further, in the absence of any other specific Council issued noise limits, that the proposed modification seeking an additional one day per month would meet the commonly accepted noise criteria. “I have reviewed the further information submitted by Renzo Tonin and Associates dated 4 February 2013. As you are aware Council does not have its own criteria for shooting range noise assessment and the additional report supports the application and confirms the use of the EPA noise criteria as the most appropriate reference guide for shooting ranges. While from a legislative point of view Council can rely on the assessment, there is no doubt that on shooting days the noise is audible at locations in the surrounding area. The issue for Council in determining the application may well rely on the question of further amenity intrusion and will no doubt be the subject of comment in your assessment. The submissions identify that there is a difference in audibility on occasions and this could be as a result of atmospheric conditions and/or may be impacted by the type of gun and charge in cartridges. I think there is a need for a condition that requires the club to satisfy Council that the range still operates in accordance with the predictive noise modelling calculations undertaken by Renzo Tonin. The applicant shall provide Council with a field assessment noise report from an acoustic consultant (not Council) that identifies that noise levels produced from the site do not exceed 90 dB (Lin) Peak Hold at the most affected properties. Measurements shall be taken from the 5 locations identified in the Renzo Tonin report dated 7th February 2000. The Section 96 Application to modify was placed on exhibition for a period of 14 days from 26 September 2012 until 15 October 2012. The notification included persons who previously made submissions to the development and to all residents located within 4 kilometres of the site. A total of 18 submissions were received in relation to the development. The key issues raised in submissions are discussed below followed by staff comment. A copy of all submissions will be available at the Council meeting. · Impact on milk production due to cows being spooked by shooting noise. One submission raised concerns with the impact of noise on the operation and proposed further development of the Four Winds Festival site. It is noted that the Four Winds has recently obtained approval to increase the use of the site to host up to 12 weekend music events and four larger events per year. The Four Winds festival site is located approximately 2.2 kilometres to the north east of the gun club. Six submissions were received detailing that they have no concern with the current generation of noise from the site and do not object to the additional one day of shooting. However, four of these submissions raised concern with the suitability of access/traffic to the site which is detailed further below in this report. 8 Comment: The Gun Club currently designate their one competition day per month on the fourth Sunday of each month. They do not shoot in December and have two competition days in January, usually the first and fourth Sunday of the month. The applicant has submitted that the training days are proposed to be designated on the second Saturday of each month. Based on the advice from the Manager of Building Services, it is considered that the issues raised concerning noise have been suitably addressed subject to the recommended draft conditions of consent. Several submissions raised concerns in respect to the current state of Murrah River Road beyond the section of road maintained by Council and that additional traffic would result in additional wear and tear on the road, and two areas are particularly hazardous after wet weather. 8 Comment: The development application was referred to Council’s Development Engineer for comment and an inspection of Murrah River Road was carried out on 10 December 2012. Council’s Development Engineer has advised that it is considered the standard of construction and level of maintenance is adequate for the proposed use. Several submissions raised the impact of additional lead shot that would be generated by the additional shoot day and the impact/contamination onto the surrounding environment. 8 Comment: The issue of lead shot has previously been assessed and considered by Council. A condition is included in the consent requiring sedimentation controls to be located over the site to trap lead shot from leaving the site, in particular, within drainage lines. These sedimentation measures were put in place prior to the operation of the Range. Council has inspected these sedimentation measures to ensure pellets are retained on-site. The most recent inspection in December 2010 identified that sediment fencing was in place and being maintained to a satisfactory standard. It is considered that this condition is appropriate to address this issue. A submission raised the issue of anti-social behaviour by some members and visitors to the Club whilst driving on the Murrah River Road. The submission detailed that this includes excessive speeding, disposal of alcohol containers on the road and the throwing of spent pellets onto the Road. Further that the Club cannot and has not corrected this behaviour in the 12 years they have lived there. 8 Comment: A review of the development application file did not identify any complaints in respect to the operation of the gun club in this regard. Inspections of the site did not identify any excessive waste along Murrah River Road or at the gun club itself. This matter will be separately taken up with the Gun Club. Another issued raised was the potential of the Gun Club activity to encourage violent and criminal activities. Recent gun violence including massacres in the United States of America was cited. 8 Comment: The definition of a shooting range is a defined recreational sport as detailed in the definitions of the Draft BVLEP 2012. The site is licensed with the NSW Police as a licensed shooting range. It is considered that the applicant has taken all reasonable steps to ensure that the site complies with all relevant requirements for gun control. 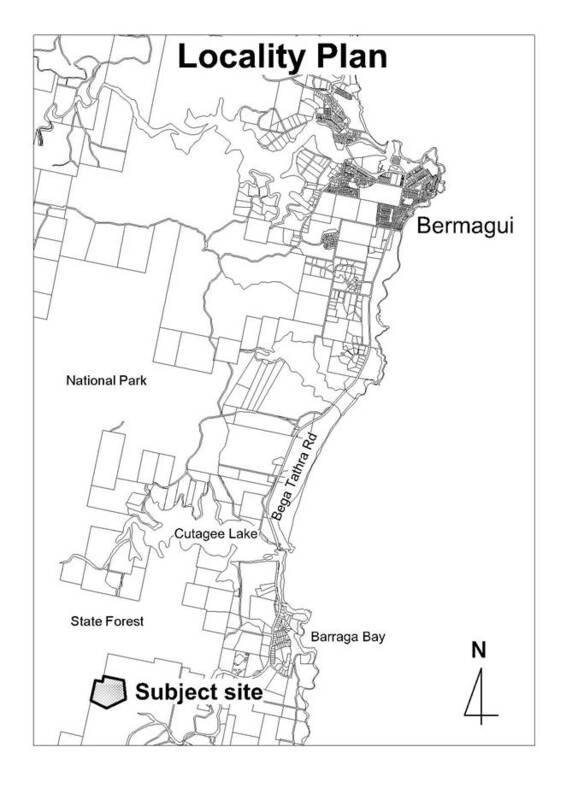 One submission could not condone rates being spent on interest free loans and noise monitoring exercises for a small group of individuals; stating the benefit is negligible to the general community and, in spite of what the Gun Club says, does not significantly benefit Bermagui or the surrounding area. 8 Comment: This is not a relevant consideration under the provisions of the Environmental Planning & Assessment Act 1979. The section 96 application to modify has been extensively notified to ensure all issues associated with the proposed additional training day per month are considered. The original and subsequent development applications were approved by Council with conditions aimed at addressing the concerns raised by residents in the locality. The assessment of this section 96 application identifies that noise and site contamination issues are still major matters for some residents and thus relevant to Council’s consideration in permitting the additional training day per month. The key issues have been assessed and it is considered that the additional use of the site one day per month satisfies current planning criteria and environmental guidelines applying to the site and its use. It is recommended that the modification application be approved subject to the draft modified consent attached to this report. 1. 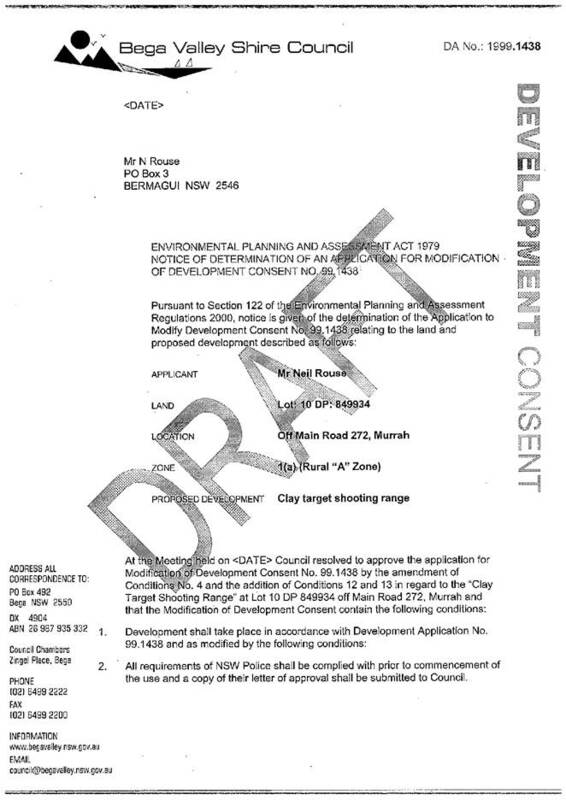 That the Section 96 Application to Modify Development Consent 1999.1438 for the Clay Target Shooting Range only Lot 101 DP 1172182 Murrah River Road, via Bermagui, be approved subject to the conditions outlined in the attached draft modified consent. Council at its meeting held on 16 January 2013 gave consideration to a staff report in respect of the Section 96 Application to modify Condition 3 of the Consent issued for a Reception Establishment and Educational Establishment to operate from the land. Condition 3 limits the operation of the use to 7.00am to 6.00pm Monday to Friday and 7.00am to 2.00pm Saturday. The applicant seeks approval to operate till 12 midnight one night per week Monday to Friday and to 12 midnight on Saturdays. The application to modify was recommended for refusal due to the potential noise impact on adjoining residences. Council resolved to defer the matter in accordance with Council’s Code of Meeting Practices as there were two deputations and also requested a further report on noise modelling be prepared. This report recommends that the application to modify be approved for a 12 month trial period. Council at its meeting held on 16 March 2010 granted approval for the change of use of an existing dwelling-house to an Educational Establishment (training facility) and temporary use as a Reception Establishment for a maximum of 28 days in any one year, subject to conditions. It should be noted that a “reception establishment” is a prohibited use in the 2(a) zone of the land, however Council approved the use under Clause 71 of Bega Valley Local Environmental Plan 2002 (BVLEP 2002) – Temporary Use of Land, which permitted the use for a maximum period of 28 days in any one year. · Extension of the operating hours for the Reception Establishment and Educational Establishment to 7am to 6pm Monday to Friday and 7am to 2pm on Saturdays. The removal of the 28 day restriction on the operations of the Reception Establishment was possible as a result of the site being added to Schedule 5 – Heritage Items of BVLEP 2002. Clause 62 – Conservation Incentives – allowed the Reception Establishment to be approved as a result of the heritage listing. No trading Sundays or Public Holidays. A Section 96 Application to Modify was received on 24 September 2012 and sought modification of Condition 3 to permit operation to 12 midnight one night Monday to Friday and 12 midnight Saturday. · The proposed modification is contrary to Clause 20 2(b) of Bega Valley Local Environmental Plan 2002 as the proposed modification does not meet the objectives of maintaining and enhancing the character of the residential area. · The proposed modification is contrary to Clause 20 2(d) of the Bega Valley Local Environmental Plan 2002 as the proposed modification does not meet the objective of ensuring that the development does not have an unacceptable impact on adjoining land. 1. That in accordance with the Code of Meeting Practice, the matter be deferred for a further report to Council including the matters raised during deputations. 2. That a further report on noise modelling be prepared by the applicant to consider impacts of vehicle movements at on-street locations in the operation of the reception centre. The modification seeks to extend the approved hours of operation for the Educational Establishment and Reception Establishment. Sunday and Public Holidays – No trading. The request for modification, if approved, would allow operation to midnight one night Monday to Friday and 12 midnight Saturdays. The site is described as Lot 2 DP 1083308, 187-189 Newtown Road, Bega. The site is located approximately 800 metres south of the Bega CBD. The property is elevated above Newtown Road and retains the dwelling-house known as “Bismarck House”, gardens and formal customer parking area at the rear of the site. Vehicular access to the site is via a concrete sealed public road that also provides access to a separately owned dwelling-house at the rear of the subject land. This access and formal parking area at the rear of Bismarck House were upgraded in accordance with conditions of this Development Consent. The surrounding landuses are predominately residential with single dwelling-houses located to the north, east and west of the site. The Princes Motel is located to the south-west of the site and a corner store is located to the south-east. A revised Noise Impact Assessment Report was submitted in February 2013 and included an assessment of the potential effect that the proposed extended hours of operation may have on the surrounding ambient noise environment. “The revised report now includes in its scope the reception room use. In addition the modelling scenarios have been amended as requested to include scenarios typical of a reception centre of this capacity. This specifically includes scenarios 11 and 14 with 40 vehicles departing from the north and south etc. The report finds generally that, with the mitigation controls recommended by the Consultant (Benbow), the onsite impacts comply with the criterion with the exception of receiver RO2 which has a very minor exceedance (1dBA). The report also found that, in terms of offsite impacts, particularly road noise, there are sleep disturbance exceedances for most receivers of between 1 and 8 Db. The consultant does note though that there are frequent and significant sleep disturbance exceedances associated with road traffic noise that is unrelated to the proposed use of the premises as a reception centre. 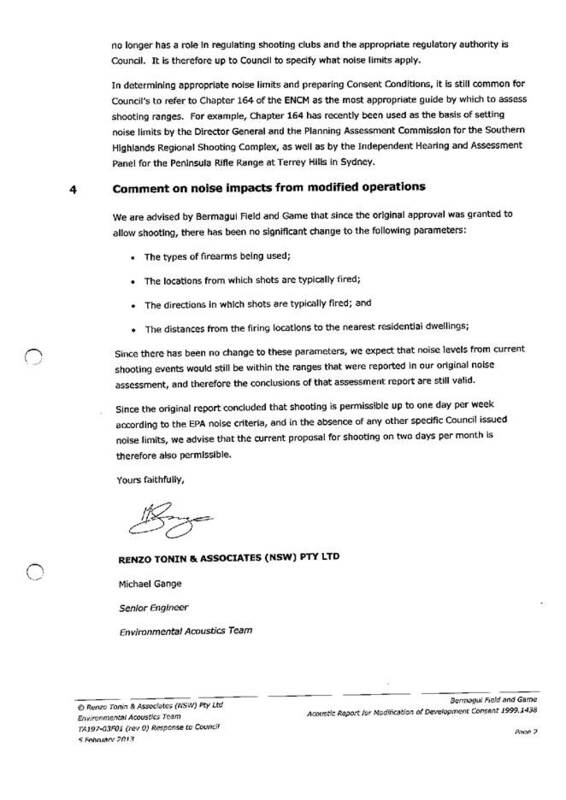 The consultant in s6.2.3.7 concludes that they, “………do not consider the predicted exceedances, ranging from 1 to 8dB(A)above the sleep disturbance criterion, to be reasonable grounds for refusal of the development application.” This should be noted as should the fact that existing road traffic usage of Newtown Road will change when the Bega By-pass is completed. I note that all the modelling undertaken by the consultant had included a number of noise control measures as factors and as such should any consent be considered for issue then the below measures need to be included in that consent. · Use of the onsite car park is strictly limited to day time hours (7am – 6pm). The exception to this is use of the disabled car parking space. · All patrons should access and depart the premises via the front door after 6pm. · Upgrading of external window glazing and window openings are to be closed. · The PA system is not to be used after 6pm or before 7am. I note these last 2 dot points may prove impractical to enforce. Other control measures and recommendations are included at S 7.0 of the consultant’s report and they should also be included in any Consent considered for issue. Finally the consultant notes (s8.0) that in order to verify and strengthen assumptions made that post commissioning validation measurements are recommended. If a Consent is proposed to be issued the following condition should also be included. A copy of the revised report will be tabled at the Council meeting. The proposed modification if approved would result in the on-site carparking area being closed at 6.00pm, with the exception of the disabled carparking spaces, and all parking would be on-street. As Newtown Road is a Highway the proposed modification was referred to Roads and Maritime Services. The following response has been received. The proposed extension to the approved hours of operation up to midnight on Saturday and 12 midnight one night Monday to Friday, would require all vehicle parking to be on-street other than for disabled parking, due to the potential noise impacts from vehicles and patrons using the rear on-site parking area after 6pm. The subject land is located in a residential area and the parking of patrons cars on-street would be outside existing dwelling houses. The report to the Council meeting on 16 January 2013 concluded that the proposed modification to the hours of operation would not be consistent with the objectives of the 2(a) zone due to potential unacceptable noise impact on adjoining residences. This conclusion was based on the available Noise Assessment Report and professional advice of Council staff. The revised noise report has indicated that the modification to the hours of operation, as requested, would comply with the noise criteria, subject to noise control measures being implemented on the use. - Closure of the on-site carpark at 6.00pm, other than for the disabled parking. - Upgrading of the window glazing. - Patrons accessing and exiting the building from the front. - PA system not being used between 6.00pm or before 7.00am. Council’s Manager, Environmental Services has reviewed the revised report and concluded that subject to the inclusion of the recommended noise control measures that a 12 month trial period would be reasonable. Further that post commissioning noise attended noise validation and monitoring should be carried out to test the effectiveness of the recommended noise control measures. There were two (2) deputations to the Council meeting held on 16 January 2013 being Mr Mark Pearson (objector) and Mr Norm Pearce (Applicant). The potential noise impacts from increased hours has been separately addressed in this report and subject to noise control measures, a 12 month trial period is considered to be appropriate. One of the measures proposed is closure of the off-street parking area at the rear of the building, other than for the disabled park, at 6pm. This would address the potential glare nuisance for vehicles entering the parking area at night into Mr Pearson’s dwelling. The issue regarding glare nuisance from the existing security lighting will be addressed separately to this application. This conclusion was based on the available Noise Assessment Report and professional advice of Council staff and accordingly the application was recommended for refusal. Council resolved to defer the matter in accordance with Council’s Code of Meeting Practice and to enable a further report on noise modelling to be prepared. The revised noise report has indicated that the modification to the hours of operation as required, would comply with the noise criteria, subject to noise control measures being implemented. Based on the revised noise report staff are of the opinion that a 12 month trial approval would be appropriate. This trial period would allow post commissioning noise attended noise validation and monitoring to be carried out and, also, to assess the overall effectiveness of the recommended mitigation measures. The issues raised in the objecting deputation to Council have been addressed as part of this report and also in the previous report to Council on 16 January 2013. The Section 96 Modification to modify condition 3 of the consent is recommended for approval subject to a trial period of 12 months. b) Notwithstanding a) above for a 12 month trial period the following additional operating hours will apply. · The existing on-site carparking area shall be closed from 6.00pm onwards other than for the use of the disabled parking space. · That post commissioning noise attended noise validation and monitoring being carried out to test the effectiveness of the recommended noise control measures. 2. That all persons who made a submission be advised of Council’s decision. Council is in receipt of a Section 96 Application to modify Conditions 32 and 33 of the consent issued for alterations and additions to an existing medical centre. Conditions 32 and 33 impose Section 64 Water and Sewer charges levied in accordance with Council’s adopted Developer Servicing Plans and Fees and Charges. The Section 96 Application to modify has been reviewed by Council’s Infrastructure, Waste and Water Group and is recommended for refusal. Development Consent was issued under delegation for alterations and additions to an existing Medical Centre subject to conditions. · 1 additional treatment room. “32. A Section 64 (Development Servicing Plan for Water Supply – 21030.146.257) contribution of $19,888.00 (2012/13) is applicable for this development application. “We request a modification to the above DA after a review of current medical services required for this practice. Please find attached modified floor plans, statement of effects and signed modification to consent form including appropriate fee. The existing consulting room shall be relocated to the new addition for improved accessibility, the existing consulting room will become the staff and computer room for both staff members and visiting medical students requirements. The existing treatment room, reception area and waiting area will remain. The existing front business managers office will be relocated to the new addition with the existing office to become the ultrasound room to be used by the nurse and the medical practitioner (note there is no requirement for access to water for the ultrasound room). The remaining 2 rooms in the new addition will allow for a laser therapy room (to be used by the medical practitioner and nurse) and an office for a psychologist. (Note there is no requirement for access to water for either room). The new accessible unisex toilet facility has been increased in size to satisfy the new amendments to the Australian Standards requirement. This toilet facility replaces the existing toilet facility removed in the existing building providing a fully compliant accessible facility. There will remain 1 consulting room, 1 treatment room and 2 toilet facilities, all other rooms will have similar use to that of Class 5 offices with no additional demand for water. The Section 64 charges are imposed in accordance with Council’s Developer Servicing Plans which are administered through the Water & Waste Water Service Section. Accordingly the request for modification was referred to the Group Manager for consideration with the following response received. “The request for modification includes an amended floor layout which changes the designation of the additional rooms to be provided. The modification proposes an additional psychologist room, medical consulting room, laser therapy room and ultra sound room. Whilst the Water Directorate does not define a “consulting room” Council has consistently applied the same methodology in determining a consulting room as a room used by a Doctor or Nurse to provide treatment. This is also standard industry practice throughout NSW by other service providers. In this case the modified plan would still result in an additional four rooms used for treatment which would be classified as consulting rooms for the purpose of Council’s adopted Fees and Charges. Accordingly as Condition 32 and 33 were based on an additional four consulting rooms there is no basis for any modification as requested. The Section 96 Modification Application request a review of the Section 64 charges imposed by Conditions 32 and 33 of the consent. The conditions and charges were imposed in accordance with Council’s adopted Developer Servicing Plans and Fees and Charges. The application was referred to Council’s Group Manager, Infrastructure, Waste and Water who has advised that there is no grounds for any reduction in the Section 64 charges. Staff maintain that the conditions as originally imposed by Council remain valid and reasonable and therefore it is recommended that the applicant’s proposed amendments to conditions be refused. · The proposed modification to Conditions 32 and 33 would be contrary to Council’s adopted Fees and Charges 2012/13 and Developer Servicing Plans for Water and Sewer. Following the appointment of Council’s Hall and Cemetery Community Committees at its 21 November meeting, four committees failed to form due to lack of nominations. A motion was carried at that time for staff to carry out further promotion of vacant committee positions and for nominations to be reported back to Council for appointment. Currently Council manages eight cemeteries which do not have committees attached. These facilities are managed by Council staff with the assistance of dedicated volunteers in the community. There have also been several additional nominations to join existing committees. Section 377(1) of the Local Government Act permits the Council to delegate its functions to a body and provides that the Council may do so conditionally. As a result it is usual for a council delegating functions to a committee to do so in accordance with a ‘constitution’ which prescribes the manner in which the committee must operate in order to exercise its functions. The relevant committee guidelines for Council committees form this constitution. · Nominate a member and an alternate to the Section 355 General Hall and Building Committee. In preparation of the call for nominations, regular discussion around the process of nomination to committees every four years has been undertaken. Letters to each committee requesting members to re-nominate were sent out in September, followed by numerous emails, phone calls and shire wide advertising via newspapers, Councils website and Facebook. Following the lack of nominations to form several hall committees, staff undertook further promotion within those communities to encourage nominations. Staff will continue to liaise with committees and the community to encourage and grow membership of committees and to establish alternative options for people wishing to volunteer to assist these facilities who do not wish to undertake a formal committee role. The nomination process and subsequent induction and training for successful nominees will be conducted by Council’s Volunteering and Cemeteries Coordinator with the assistance of the Committee and Cemetery Liaison Officers. Staff will provide ongoing support for committee members to carry out their delegations. 20 additional nominations to Council’s Hall and Cemetery community committees have been received. Individual nominations are included in the attached confidential memo. This brings the total number of volunteers on Council’s Hall and Cemetery community committees to 168. This reinforces the commitment from a broad cross section of the community to supporting these valuable assets. There are still two Community Hall Committees (Tathra and Pambula Court House) that failed to receive enough nominations to form a committee, however with the assistance of the dedicated volunteers who have offered, Council can implement a strategy to manage these facilities without a committee attached and little impact of staff resources. Volunteers at these facilities have offered to assist with general care and maintenance, while existing Council staff (Committee and Cemetery Liaison Officers) will manage the financial aspects of the facility. 2. That Council staff work with volunteers who have nominated to assist with the management of facilities which failed to receive enough nominations to form a committee, and continue facility management with the assistance of these committed volunteers in the community. In total 20 nominations were received for positions on Council’s 7 individual hall, and 2 individual cemetery committees. Below is a table of the committee nominations and recommendation. The following committees still do not have enough nominees to form a committee however there are several dedicated volunteers who are willing to work with Council staff to assist in the ongoing management of the facilities as recommended in the report. Bega Valley Shire Council is the legal Approved Provider for two out-of-school hours programs for children aged 6 – 12 years. Families using these services contribute to the economic and social sustainability of the Bega Community through work, study and volunteering. Until 2005 BVSC Bandara Children’s Services provided 10 After School and 10 Vacation Care programs from its site in Bega. Increased demand for Vacation Care places prompted the program to be moved to Bega West Public School and expanded to 30 places. The After School program continued to operate 10 places from Bandara Children’s Services. Families using both these school age programs pay fees and are eligible for Commonwealth Child Care Benefit subsidies. In 2012, National Children’s Services Law, Regulation and Quality Standards were introduced across Australia. For the first time in NSW, Out of School Hours (OOSH) programs became regulated. The introduction of the National Children’s Services Law coincided with the closure of Bega West Public School and a transfer of the Vacation Care program to Bega Valley Public School. The After School and Vacation Care programs and their venues are now required to comply with the Law for certification of premises and staff, participation in quality processes, compliance, inspection and audit assessments of programs, children’s health and safety, physical environment, leadership and management, and records. As a result there have been changes to key aspects of all school age program operations. These changes are significant for BVSC’s legal role and obligations as Approved Provider of the services. The Approved Provider is liable for sanctions, fines and penalties for breaches of the new legislation. The legal requirements include greater responsibility for risk control and management, duplicated external compliance, reporting and accountability procedures, and higher qualifications for program staff. These changes have resulted in increased operating costs. There has been limited impact from changes for After School care programs because they operate from an existing BVSC site at Bandara Children’s Services where staff and reporting requirements can be shared. There are also effective environmental risk management strategies in place at Bandara which comply with Law and BVSC’s workplace health and safety policy and procedures. However, the school site presents increased exposure to legal, health and safety risks and financial penalties for BVSC as Approved Provider of the Vacation Care program. These risks are largely connected to operating the Vacation Care program from a site not under BVSC’s care and control. An injection of funds from BVSC would be needed to continue to operate an affordable program from the Bega Valley Public School site. These funds would be used to employ additional qualified staff to minimise some of the environmental risks, and to manage the duplicated operational requirement including compliance and reporting tasks. The program would also need to recruit a qualified and certified educator for the statutory position of Nominated Supervisor. Even with these measures in place, there would still be uncontrolled risks associated with operating the Vacation Care program from a venue not owned by BVSC without undertaking mitigation works. There are also no opportunities for cost sharing/ savings for Vacation Care while it is located at the Bega Valley Public School. All areas of risk can be reduced and service delivery costs managed more effectively by returning Vacation Care to its original operating site at Bandara Children’s Services. This may impact some families because there would be fewer available Vacation Care places. · NSW Children (Education and Care Services National Law Application) Act 2010. · Commonwealth Education and Care Services National Regulations, 2011. · The current Bega Valley School site and facilities permits unauthorised public access to children and does not prevent children from leaving the service without authorisation. Risks associated with public access issues are currently controlled by employing additional staff. This increases costs to families of service delivery. · The school plans necessary major maintenance on buildings and grounds during school holiday periods. This increases the number of people not employed by BVSC and the types of potentially hazardous activities operating on the site when Vacation Care is operating. · Bega Valley Shire Council is unable to address environmental risks and hazards to users or workers in the Vacation Care program at once because the building, equipment and grounds are owned and maintained by the Department of Education. The process is further complicated by the absence of Department of Education staff during holiday periods. · A significant amount of equipment is transported from Bandara Children’s Services to the school site by BVSC Vacation Care staff for use by children in the program. This increases the risks of manual handling injuries to program staff. The proposed Family and Children policy recognises that there is a role for local government to play in supporting the capacity of all families to live well, care for, protect and educate children and to make meaningful contributions to the community. This is articulated in the Charter for Councils under the Local Government Act, 1993. The Family and Child policy describes Council’s role as a mix of information provision, interagency connection, community engagement and delivery of affordable services that enable families to work, study and volunteer in the shire. The building, access and surrounds at Bandara comply with BVSC workplace health and safety requirements, and with National Law. Of particular importance is the way the lay out manages and controls authorised access to children and to the site. Bandara Children’s Services can provide a reduced number of Vacation Care places on its site. It also has available a significant number of school age materials, equipment and resources that are safe, clean and in good repair. This reduces manual handling risks of transporting these resources to the school site. Minor capital expenditure would be needed to improve supervision of children using shared adult toilet facilities. Increased use of facilities at Bandara Children’s Services by older children would add to maintenance costs for the asset, particularly in the outdoor environment. 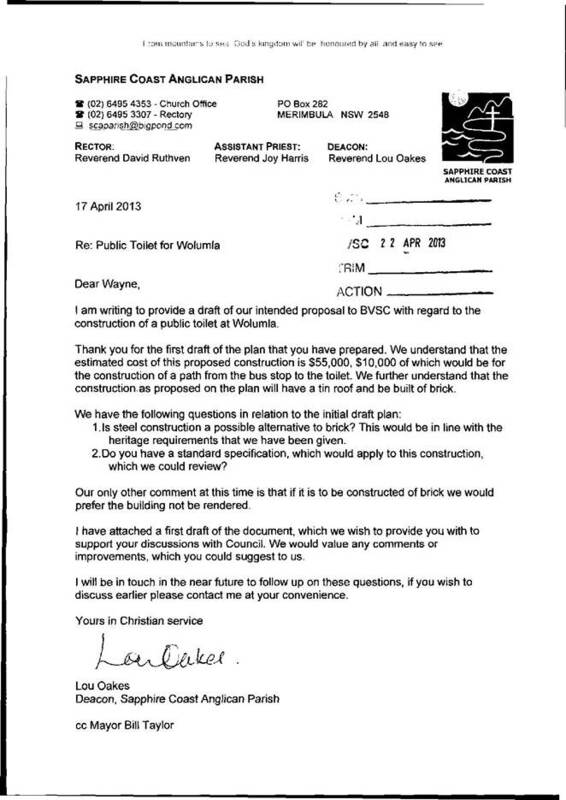 This would need to be monitored and assessed closely by Bandara’s WH&S officer and Nominated Supervisor. BVSC has care and control of the Bandara site where there are established policy and procedures for prioritising, managing and responding to risks and hazards. Any site used for After School or Vacation Care needs to comply with Law and Regulations. These areas are addressed specifically in Part 6, 161 – 175 of the NSW Children (Education and Care Services National Law Application) Act 2010. Penalties for the Approved Provider and Nominated Supervisor associated with breaches of these areas range from $1,000 to $50,000. · The Vacation Care program is responsible for maintaining the site during the period of their use and for ensuring its school readiness prior to the commencement of each term. This includes erection/ removal of temporary fencing, organising for ground works (mowing) of the space that was bounded by temporary fencing, undertaking any restitution works if any damage to grass is caused by temporary fencing, cleaning of the school hall and toilets, and covering the cost of winter heating (gas). This follow up information provides an overview of the cost effects of continuing to operate a 20 place Vacation Care program at Bega Valley Public School using increased risk management and control strategies. It also identifies Tarraganda Hall as a potential future Vacation Care venue. There are four areas in which increased risk management and control strategies generate additional necessary expenditure each vacation care period at Bega Valley Public School. An additional staff position would be required to operate the program each vacation care period. The position would ensure the effective supervision of children within perimeter fencing and control public access to the program when operating from the school site. The additional position would be used to increase the staff: child ratio. · Current BVSC Educator: child ratio 1 adult: 15 children. Additional non-contact hours would be required to ensure daily risk management assessment and control responses on the school site, completion of quality assurance processes for the program, staff rostering and human resource management, administrative reporting and processing of data. Total hours assigned to non-contact administration and management duties 2 hours per day. There is no suitable site for erecting an easily accessible and secure storage area that can be used by the Vacation Care program. An alternative strategy for reducing the risk of manual handling injuries has been identified. Skilled and equipped staff from the Bega Town Team could transport program materials and equipment to and from Bega Valley Public School and Bandara. The cost of their time and any equipment has been included. Costs incurred in this area are associated with continuing to use the venue (rental), meeting the requirements of the venue use agreement and regulation hygiene requirements (cleaning), maintenance of grounds (mowing), replacement of gas/ heating used (winter program), and reducing risk of public access or unauthorised entry/ exit to the venue and children (fencing). This report illustrates the impact on family fees of prioritising a risk management approach to service delivery using a fee cost recovery strategy; a BVSC approved contribution from rates revenue strategy and contrasts this with a cost savings and program transfer strategy. · Utilisation varies across each program period. The cost of operating a 20 place vacation program at Bega Valley Public School has been based on attendance rates in past 4 programs. July 2012 average: 20 places. October 2012 average: 14.3. January 2013 average: 18.2 April 2013 average: 14.2. Tarraganda Hall has been suggested as an alternative venue for a 20 place Vacation Care program. The Tarraganda Hall has sufficient indoor but would need some modifications to the outdoor space to meet Regulation requirements. An initial discussion has been held with the Tarraganda Hall Committee who indicated that they would be happy to progress discussions. The facility has some bookings which would need to be reviewed and at a minimum modifications to toilets, fencing, heating/cooling would need to be undertaken. 8. Submit approval and transfer applications to Department of Education and Communities, including site drawings, plans, building practitioner certifications. 10. Program approval from Department of Education and Communities. 12. Stage 2: 6 – 12 weeks. 13. NB Final site approval inspection by the Department of Education and Communities can take up to 12 months. However, interim approval can be received within 3 months. The Town Hall project would provide an indoor venue suited to the operation of a 20 place Vacation Care Program. However, there would be no outdoor space and so it would not be approved by the Department of Education and Communities. These have also been suggested as possibilities for investigation. The Showgrounds facility is managed by a Reserve Trust. Discussions have not commenced with the Trust at this stage. Fewer Vacation Care places may impact some working families and those in high risk early intervention and support situations. Without Vacation Care, they may need to use informal or ad-hoc care for their children. This could include using their own leave entitlements, friends, extended family, or family day care. Recent Vacation Care programs show that working families are the most strongly represented user group. Their patterns of use also highlight that families often cancel bookings with 24 hours’ notice, or do not use their booked day. At the last minute they choose alternative activities such as trips with friends, visits to relatives or other activities provided within the community at low or no-cost. These patterns suggest that early links to organised alternative activities may reduce the number of families with unused bookings. Last minute cancellations impact on the cost of providing Vacation Care in two ways. Firstly, the Vacation Care program employs staff based on the number of children who are expected to attend. This means when numbers of children are lower than expected, staff costs are higher than necessary. Secondly, it is difficult to fill last minute cancelations. This means the income for the program is lower than expected, and the operational costs continue at a higher level. These costs are distributed across all families using the service through the fees and charges that are set. These is scope for Vacation Care staff to respond to the social impact of any gaps created in service delivery by increasing the emphasis on promoting and linking families to alternative school holiday activities and programs offered by businesses within the shire. The users of Out of School Hours services make a contribution to the economic and social sustainability of the community. Most users of the program are working, studying or contributing in a voluntary capacity to other community organisations or caring for aging family. Some families may be unable to continue to work, study or volunteer during school holiday periods without care for their school age children. This may disadvantage small business in the community because of higher levels of employee and volunteer absences. There may also be benefits to some small businesses and community organisations from linking families to alternative activities being offered for children aged 6 – 12 years during school holidays. These include activities offered by AUSWIDE Merimbula Vacation Care program, Library Services, the Marine Discovery Centre, Coast-life, Sports groups, Pambula Aquatic Centre, Fling, National Parks Bournda and others. Throughout 2012, Vacation Care and After School care staff provided review, evaluation and feedback to Children’s Services managers about the operation of Out of School Hours programs under the NQF. Feedback has been used to identify and manage the risks to BVSC of current Vacation Care program operations. In February 2013, letters were sent to all community and education organisations involved in the provision of programs to children aged 6 – 12 years. Organisations were invited to discuss the provision of Out of School Hours programs in Bega. A similar invitation was placed in the Families NSW newsletter. No contact or expressions of interest have been received. Staff raised the matter of potentially investigating Tarraganda Hall as a permanent home for Bega Vacation Care at the Committees last meeting on 8 May. There has been some concern noted initially about families accessing the Hall which is a little way out of town. The range of options for Out of School Hours services were discussed with the NSW Department of Education and Communities, Early Childhood Education and Care Services Directorate, Out of School Hours services Team Leader and the Department of Education, Employment and Workplace Relations Child Care Benefit Team Leader. Families using Vacation Care program will be individually informed about any changes approved by BVSC to the current school age programs. Staff will use a range of communication strategies including an individual letter to each family, face-book and notices on the BVSC website. Under the Commonwealth Tax Law families will only be eligible for Child Care Benefit if each program operating from the Bandara site has its own Service Approval number. This means there are some increased costs and administrative/ management requirements that must be duplicated so that families can continue to receive benefits. While a change of venue for Vacation Care does not avoid duplication of all fees and charges, if the program moved to Bandara there would be cost savings associated with the need for fewer qualified staff. Current budgeted Vacation Care staff salaries for 2013/ 2014: $ 25,509. · Salary cost savings from change of venue: $13,848 (plus on-costs). · Daily savings for average family: $6.00 per child per day. If the program moved to Bandara the remaining savings would be redirected to cover duplication of administrative/ management processes at Bandara. Vacation Care program should remain eligible for $11,742 Sustainability Assistance under the Commonwealth Community Support Program if it operates from Bandara Children’s Services. Scenario 1 Remain at Bega Valley Primary School at 19 places per day average for 2013/14 financial year assumes an average of 19 places per day used for average of 8 hours at Bega Valley Public School. Scenario 3: Move to Bandara Children’s Services assumes an average of 10 places per day used for up to 10 hours at Bandara. NB: Fees for Vacation Care and Afterschool Care at Bandara would be the same. Vacation Care children would also be able to access meals provided at Bandara, adding to the benefits of the program for families. The current position of Council has been that funded and fee services in children and community services areas are fully funded by those income sources. Council can resolve to allocate general rate funds to Vacation Care of $25,000 for the 2013/14 year to allow the program to continue operation at Bega Valley Primary School while staff continue discussions with Tarraganda Hall and report back to Council on a one off injection of funds to establish that site as a permanent Vacation Care site. Council can resolve to allocate general rate funds annually to Vacation Care of $25,000 for the 2013/14 year and appropriately budgeted in subsequent years to allow the program to continue operation at Bega Valley Primary School into the foreseeable future. The current premises at Bandara can include 10 After School and Vacation Care places. There are already significant school age resources, equipment and materials available at Bandara. Some minor upgrades to shared school age toilet facilities would improve access and supervision. Under the National Law, Vacation Care requires two staff to be on premises at any time. This is costly when there are only a few children in attendance at Bega Public School. The transfer of Vacation Care to Bandara would allow for a single staff member in the school age program who can work with other staff at Bandara when there are low child numbers. Transferring the Vacation Care program to Bandara would reduce the number of additional qualified and experienced staff required to operate the program because there are other staff on site at all times. In addition, one staff member can be a Nominated Supervisor for all programs at the site. This would reduce the number of staff required in statutory roles. BVSC has had difficulty in recruiting and retaining qualified and experienced Vacation Care program staff. This is linked to the short periods of available employment for staff, and the requirements for higher qualifications and training. There would be improved opportunities for casual staff to access alternative employment within the other children’s programs offered at Bandara. Vacation Care would remain eligible for ‘Sustainability Assistance’ providing it has an individual Service Approval number. Continued funding would offset some of the costs associated with duplicated Out of School Hours management and administrative processes. L7.1 Improve access to affordable learning opportunities for all children. Strategic actions: Implement transition to National Quality Framework for children’s services workforce and service operations. The transition to the National Quality Framework (L7.1) has increased the cost of staffing and providing school age services. These changes to Law have had the greatest impact on fees for families using Vacation Care programs. The move of the Vacation Care program to Bandara would create a lower cost service to families. There would be less income generated by fees but this is offset by the savings made in staff employment costs. These savings could be passed on to families as reduced and more affordable fees. Bega After School and Vacation Care programs have been affected by changes to National Law, Regulation and Quality Standards. The most significant impacts have been in the areas of cost of program delivery, increased duplication of Government accountability and reporting processes, and additional risks for Bega Valley Shire Council as Approved Provider of these services. There have also been increased risks to BVSC in operating children’s services at a site not under its direct care and control. Increased costs and risks could be managed more effectively by relocating Vacation Care to Bandara Children’s Services with a reduced number of places. Bandara Children’s Services has staff with the skills and expertise to meet the requirements of delivering Vacation Care Services within the NQF, and the site facilities, resources and equipment can accommodate school age children. There will be some families in the community who may be affected if there are fewer Vacation Care places. BVSC has existing community engagement strategies that can link these families with alternative activities for school age children. There are currently no other organisations in Bega with the capacity or interest in delivering these programs to the community. That Council resolve its level of support for the 2013/14 Vacation Care Program. Presenting draft Merimbula Airport Masterplan for the purpose of exhibition for community, user, agency and carrier comment. Council decided to proceed with the preparation of an Airport masterplan and business plan as recommended with the Merimbula Airport Strategy, rescinded last year. Rehbein Airport Consulting was engaged following a tender process, in accord with the brief. Consultations and presentations have been held with councillors, agencies, Merimbula airport operator and users. The Masterplan had been prepared as an informing and integrating document with the Business Plan. Based on development options preferred by councillors (finalised after consideration of agency and community feedback following exhibition of the draft Masterplan), it is anticipated the Business Plan will draw on the capital works estimates, scale and triggers to illustrate funding scenarios under the lease, contract or direct management models. An airport masterplan is a precursor to federal grant applications such as RDAF or security equipment grants through Department of Infrastructure. Airport master planning is undertaken to enable best-management practises and sound land-use development in addressing diverse aviation and community interests. An Airport Master Plan is the primary strategic tool available to airport owners and operators and communicates the operator’s intentions with respect to development of the airport. Its purpose is to set out a long-term framework for the development of all facilities within the airport that protects future development against the effects of current decisions. Representations have or will be made to state and federal agencies and Ministers regarding planning and funding for the airport. A copy of proposed layouts and staging is attached. The Civil Aviation Safety Authority (CASA) is the statutory authority that conducts the safety regulation of civil air operations in Australia including the regulation of certified and registered aerodromes. The Manual of Standards (MOS) - Part 139 Aerodromes is made pursuant to Civil Aviation Safety Regulations (CASR) Part 139. CASR Part 139 sets out the regulatory regime for aerodromes used by aeroplanes conducting air transport operations. The MOS sets out the standards and operating procedures for certified, registered aerodromes and other aerodromes used in air transport operations. Runway 03/21 is 1,602 metres long and 30 metres wide. The runway strip has a width of 90 metres and a length of approximately 1,722 metres. The runway is classified as Code 3. The runway has a sealed surface with a published Pavement Classification Number of 8/F/A/580(84PSI)/U. Based on published Aircraft Classification Numbers, the runway strength is suitable to accommodate Saab 340 or Embraer EMB120 aircraft, assuming a subgrade category B. The runway pavement is currently showing designs of distress and surface failures. A project to upgrade the runway pavement is currently underway including a 300mm overlay, in accord with pavement reports prepared by Aurecon and Hyder, following Council resolutions to renew and strengthen the runway. Councillors inspected the renewal and strengthening works on 8 May. The draft outlined planning parameters including runway and terminal capacity, parking, obstacle limitation surfaces, noise exposure, as well as planning matters involved with development opportunities. The draft Masterplan proposes staged modifications to facilities, new buildings or extended infrastructure to accommodate the projected passenger growth and design aircraft likely to be operating in the regional aviation sector, over the next 20 years. For example, the existing terminal space may be extended to accommodate ‘peak hour’ passenger loads and security equipment, and later used as a visitor information and cultural gallery centre, once a new terminal is built on the southern edge of the airport should passenger loads (and regulatory environment) require it. Similarly, new hangar buildings are proposed, organised around taxiways and fuelling, some of which may require resiting. In 1985 there were approximately 36,000 passengers per annum, dropping to approximately 24,000 in 2002. In 2003, Regional Express (Rex) began operating to Merimbula. From this time passenger numbers grew to 66,000 in 2007 which equated to an annual average growth rate of approximately 25% over this 5 year period. Since 2007 passenger numbers have been falling. In 2011 there were approximately 51,000 passengers per annum. The decline in passenger numbers has however started to slow. The medium growth scenario assumes growth in the tourism market to Merimbula and the entrance of a major regional airline to Merimbula operating larger aircraft, such as the ATR72, Dash 8-300 and/or Q400, to facilitate travel to and from the region by air. The scenario assumes that Rex or a similar minor regional airline continue to operate services largely as they are currently operated. This results in an annual growth rate of 5.3% over the 20 year planning period and a total of approximately 150,000 passengers per annum by 2033. A number of local and regional strategies recognise the airport as a significant economic driver, not only for accommodating business, emergency and health travel, but potentially growing into the leisure market. It was the latter the former Strategy sought to penetrate, to add competitive and alternative travel options into the shire, capable of integrating with the cruise and touring drive options being developed though SCT and ACW for example. Notwithstanding, the Route Feasibility Report and SCT and ACW plans recognise investment and coordination in tourism accommodation and product is required to consolidate leisure travel growth. The draft Masterplan also proposes an aviation related Business Park, to strengthen the opportunity for business growth and complementary financing for airport redevelopment. The former Airport Strategy proposed, in recognition of growth prospects forecast by the Route Feasibility Report and other studies, to target a Design Aircraft 3C to accord with the Airport 3C category. The Aircraft 3C classification accommodates SAAB (operated by Rex), Jetstream (operated by Brindabella), Q400 (operated by Qantas), and ATR72 (operated by Virgin). The Strategy proposed a long term (20 year) passenger planning horizon of 150,000. The brief sought to identify what capital works were required to bring and maintain the airport at 3C standard, based on what passenger of design aircraft thresholds, and staged in a sequence recognising regulatory, planning and financing requirements. · Inform the Merimbula Airport and Precinct Strategy. The new LEP has accommodated the aviation and related uses on the subdivided airport proper site. The draft Masterplan has been prepared through aviation sector research and utilised existing studies and reports of council. While the airport operator, users and agencies were consulted during its drafting, it is appropriate to seek community comment and formal agency, user and carrier feedback prior to finalising. The Draft Masterplan signalled the following concept costs for the above Stages, noting the scope of some of the works may be modified pending any concessions determined with CASA in recognition of Merimbula’s operations as a regional airport with OLS constraints. For example, the works suggested at Arthur Kaine Drive may be minimised by concession from CASA or removal of part of one of the three lanes from the northern runway splay. The draft Business Plan will outline the funding options for the above, pending Council’s decisions on the operational and development model for the airport. It is proposed to exhibit the draft Masterplan separately from the Business Plan to gain community, operator, user, carrier and agency feedback, which may cause modifications to its content, layout, staging and capex estimates. That information may then be commuted into the Business Plan, utilising a separate consultancy to interpret the masterplan and its estimates, and present funding scenarios based on lease, direct management or contract management models for the operation and development of the airport. It is anticipated the Masterplan will be implemented over a 20 year horizon, with any developments or upgrades triggered by the events and loadings signalled in the masterplan. Further, while the masterplan is prepared in $2013, its implementation is subject to future costings and approval of CASA and other authorities, and ultimately subject to availability of funds from sources other than rate revenue including grants. Consideration of submissions and any amendments to the masterplan should guide the final version of the Business Plan expected around July, after which Council will need to determine the operating and development model for the airport, and put steps in place to move to the new model by June 2014 when the lease expires. 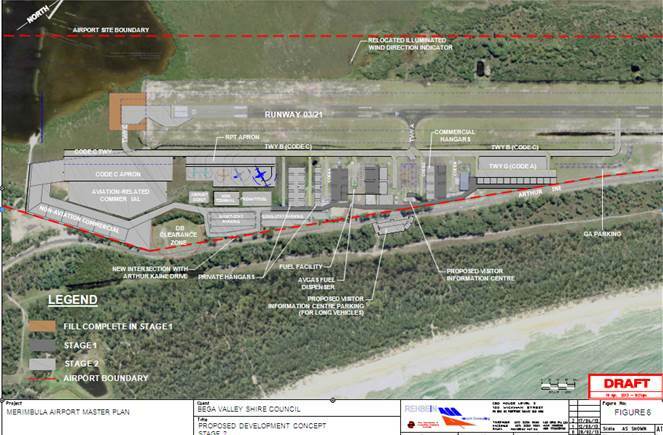 That the draft Merimbula Airport Masterplan be exhibited for 40 days, seeking community, user, agency and carrier comment, for a further report to Council. Presenting draft revised Eden Port masterplan for purpose of exhibition for community and agency comment. In 2005 a Master Plan for Eden Port (Snug Cove) and Environs (2005 Master Plan) was prepared under a partnership between Council and the (former) Department of Infrastructure, Planning and Natural Resources. Since 2005 there have been changes in the conditions within and effecting patterns of use of the Snug Cove Precinct, and a number of development opportunities have emerged. With reference to previous reports to Council on Eden Port from 2009, including the most recent on the RDAF application, Council has progressively prepared concept designs, feasibilities and planning and funding proposals to redevelop the Port, aiming through the redevelopment of precincts & infrastructure to transform the Port of Eden into international tourism and research precinct and strengthen its prominence as a working port, servicing timber, fish & renewable energy freight and supporting offshore supply vessels from Bass Strait. The new LEP and DCP guidelines presented opportunity to reconsider the best development uses for key sites, noting the fuel depot and cannery sites were addressed in the 2005 masterplan, but marine research and waterside infrastructure for example, weren’t considered. · Update the 2005 master plan concept plan and modify the principles and controls for Snug Cove to reflect the updated concept plan. The study area excluded Cattle Bay as it is the subject of an approved development concept, and did not propose to alter. 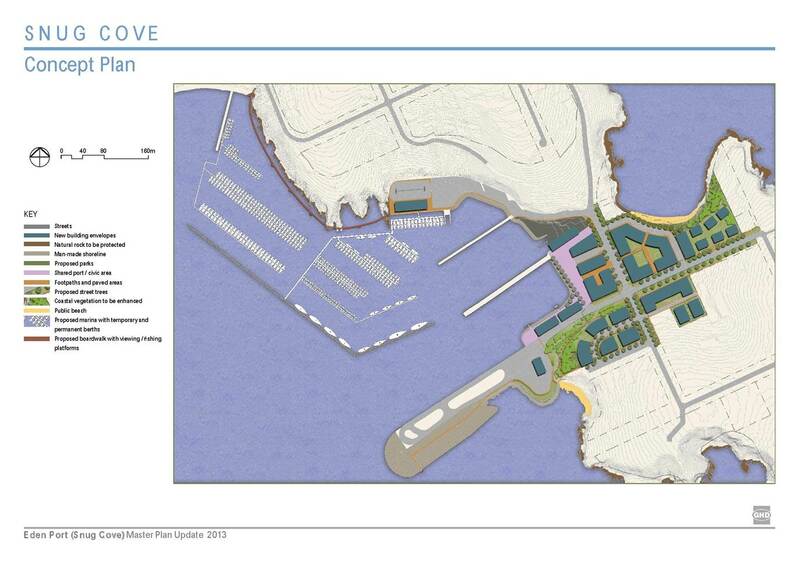 An indicative concept plan is attached. The Aims and Objectives of the 2005 Master Plan for Eden Port (Snug Cove) and Environs remained valid and guided the review of the master plan and assessment of proposed changes. Any inconsistencies of the revised Plan to the new LEP/DCP can be addressed through planning proposals. Once the masterplan is exhibited and any modifications contemplated, Council may receive development applications in the context of the masterplan. The updated concept plan provides an overview of the layout and distribution of open space and built form that may occur within the parameters as modified by the 2013 Master Plan Update. The Revisions to the 2005 Master Plan for Eden Port (Snug Cove) and Environs Planning Principles and Controls details the changes to the Character Statements, Principles and Controls section of the 2005 Master Plan to reflect the intent of the updated master plan. Minor variations and alternative design solutions for Snug Cove to the layout and scale shown on the updated Concept Plan may be considered as part of the Development Application process providing they are consistent with the objectives, principles and controls of the updated master plan. y an area identified for potential land reclamation within Snug Cove to provide for hardstand and operational facilities associated with the proposed marina. The requirements for preparation of Development Applications remain as identified in the 2005 Master Plan. Sapphire Coast Tourism Ltd (SCT) is an independent body funded by membership and financial support from Council through a special variation to rate income. SCT supports the operation of the local industry and liaises with State and National agencies, local Chambers and other operator groups. SCT has been very active in attracting grants through the Federal Governments TQUAL program and has worked on a number of programs with Council including the Shire signage program and development of Australia’s Coastal Wilderness programs. In 2012/13 SCT raised $15,000 from town tourism bodies and $5,000 from Council for inclusion in the 2012/13 South Coast Regional Tourism Organisation (SCRTO) Demand Funded Marketing Campaign. This allowed the Bega Valley area to be profiled as a part of the campaign, with larger Shires gaining the majority of the exposure. Planning is now underway for the 2013/14 campaign. Funding raised locally by SCRTO is matched dollar for dollar by Destination NSW and currently the SCRTO is able to access up to $892,000 in total. Bega Valley Shire Council previously contributed to the program directly through the tourism budget prior to the restructuring process commenced in 2005/06. The Demand Funded Marketing Campaign is run through Destination NSW marketing and media agencies employed to manage the planning for the campaigns under briefs developed by the specific tourism organisations. Destination NSW has also funded the advertising production work including television commercials and print advertising. SCT has taken significant steps over the last three year period with an active volunteer board and one full time staff member. The web site has been revamped, the management of the Merimbula Visitor Information Centre reviewed, the development of a major cultural heritage tourism project, the finalisation of the Killer Whale Trail as well as actively participating in Council, ACW and other activities. SCT have recently completed the first draft of a Destination Management Plan and are undertaking further work on the implementation of the heritage tourism project and collaborative initiatives with town chambers and tourism bodies. SCT Ltd believe however that they are unable to drive any significant additional fund raising programs through their members to participate in the 2013/14 Demand Funded Marketing Campaign to capitalise on the work done by SCT and the 2012/13 experience. SCT Ltd have written to Council outlining a request for a one-off contribution of $100,000 to add to a target industry contribution of $20,000 allowing an allocation of $120,000 to the 2013/14 Demand Funded Marketing Campaign. This would then leverage $120,000 from Destination NSW. Council does not currently have a policy on tourism however in the review currently workshopped by Councillors, a draft policy is under preparation. Council recognises tourism as a key driver of the local economy, providing jobs and investment. In recent years, Council has significantly reduced its direct financial support for tourism marketing and promotions, considering these activities are the role for the tourism industry itself. Council consider its long term role as providing “hard” tourism infrastructure, visitor information centre premises, parks, boardwalks, toilets bbq’s etc. · Develop economic/tourism strategy to generate investment and employment, including expanded tourism product and facility. To that end, Council has recently planned, invested, or facilitated investment in airport, seaport, signage, jetties and wharves for example. Council led a business delegation to China last month, aimed at building knowledge of the agricultural, education and manufacturing strengths of Bega Valley, but focussed on attracting visitation and investment in tourism facilities here, given the shire’s proximity to Sydney, Canberra and Melbourne, and access be sea and air. Council adopted its Tourism Strategy in 2009/10 outlining the role of council, SCT, agencies and business in relation to funding, infrastructure, information services and marketing. An agreement is in place with SCT Ltd until June 2014 at which time the relationship will be reviewed and a further business plan and agreement will be drafted. There are also minor budget allocations to support festival development and undertake research, such as $15k granted to Eden Whale Festival. Council provides Visitor Information Centres at reduced rent to chambers and tourism groups and allocates the tourism infrastructure special variation approved in 2007/08. There is currently no allocation proposed in the draft 2013/14 budget which was on public exhibition in February or in the Council’s long term financial plan. This request for one off funding of $100,000 for the 2013/14 year, if supported by Council, could be referred to the budget adoption process for reporting at the Extraordinary Meeting on 26 June 2013. Resourcing of this area through provision of tourism infrastructure such as wharves, jetties, visitor information centres, signage and the financial commitment has been mainly through two special variations approved over the past five years. Staffing has been provided through liaison with existing staff. The proposal presented by SCT Ltd outlines their genuine commitment to working with the sector to build product and to strategically place the Bega Valley as a desirable destination for visitors, business and lifestylers. The 2013/14 Demand Funded Marketing Campaign offers outcomes for tourism in the area but has a broader application. That Council consider its position in relation to the request for $100,000 for the Destination NSW 2013/14 Demand Funded Marketing Campaign. Report on Bega Valley Shire delegation to Nanyang, Henan Province China. 1. That Council engage in trade and education visits with China including Nanyang and include school, university and workplace organisations to participate, and further consider participating in the next APEC convention in 2014. 2. Council be proactive in marketing the Sapphire Coast and the Wilderness Coast as a tourist destination for overseas visitors including China. Council aimed to establish a letter of intention to cooperate with Nanyang. Subsequently, upon the invitation from the City of Nanyang, Henan province, Council sought expressions of interest from business, education and community to accompany a delegation, at the personal cost of the individual. Over ten initial expressions were received, with some unable to make final arrangements. Bega Cheese, University of Wollongong and Illawarra TAFE were also invited to accompany the delegation, but were unable given the relatively short lead time. From 23 April 2013 to 1 May 2013 – eight members of the Bega Valley Shire attended a business tour to China, facilitated through Australia International Trade Association (AITA). The delegates were Cr Michael Britten, Robert Hayson, (Chair Bega Valley Shire Business Forum), Janette Neilson, (Secretary Bega Valley Shire Business Forum), Natalie Godward, (President Merimbula Chamber of Commerce), Debbie Isles, (Vice-President Merimbula Chamber of Commerce), Anthony Osborne, (Tourism and Marketing Manager Sapphire Coast Tourism), Gregory Britten, (Tourism & Hospitality Manager Robyn’s Nest) and Bega Valley Shire Council General Manager. The composition of the delegation proved to be an excellent mixture of Business, Tourism and Council Representatives with all members of the delegation working as a team & participating in presentations made by the Council to each of the Chinese Officials groups who met with our delegation in each of the Cities and Counties that were attended. The hosts were governors, mayors, party secretaries or heads of bureaus of trade, commerce, tourism, education or agriculture. At each meeting, presentations were made on behalf of the Bega Valley Shire by the General Manager, with the assistance of Anthony Osborne of SCT, fine tuning each presentation to the specifics of the city or county and the likely areas of cooperation. Other members of the delegation assisted with the exchange of gifts and one on one business exchanges with representatives from their equivalent business and tourism organisations. Material provided to each of the Chinese counterparts included information on the delegates, business brochures and DVDs. Business cards were exchanged to enable the delegation to continue developing relationships and possible business ventures in the future. Mr Hayson recorded the visit extensively on both still and video cameras and in due course a full record will be produced of the visit. · The Official Office of the Australia International Trade Association and Michael Guo in Beijing where apart from our formal presentation, additional meetings were arranged with a Representative from Minsk, Belarus’ in Russia & Li Jinchu, Vice Director Overseas Chinese Affairs of Shanxi Province, being the Province adjacent to Henan which was the focus of our visit. · The group headed by fast train to the capital of Henan Province (city of Zhengzhou) where a meeting was arranged with the Heads of Government for the Province to enable their approval for each of the areas to be visited to work towards establishing future relationships with the Bega Valley Shire. · The group then travelled to the City of Pingdingshan (population 5,500,000 covering an area of 7.9 sq. kilometres) which is a new city in China having been established in 1957 in one of the ancient areas of China. It was once an agriculture area but is now prominently regarded for its coal production. A very productive meeting occurred which is likely to lead to future relations being established with that city and with a possible visit by its representatives to this Shire in the near future. Our Tourist Representatives made strong contacts in this regard for promoting the Bega Valley Shire for tourist visitation from China. As in all of the Counties and cities visited, the hosts were considerate and attentive. The delegation was specially treated to the final resting place of Buddha, which is near their city. · The Delegation next moved on to the County of Tanghe which has a population of 1,280,000 and an area of 2512 square kilometres and is a County under the jurisdiction of Nanyang. Apart from the presentations from both the Chinese and ourselves and the Expression of Intent to form future relationships, our hosts took us through their newly established factory areas including manufacturing of piston heads for motor bikes, screens for mobile phones & other manufactured products including disposable doona and carry bags. It was explained that foreigners had been encouraged to invest in China with tax breaks, low cost land and inexpensive labour during set up periods, to ensure businesses survive and benefit the Chinese economy overall. 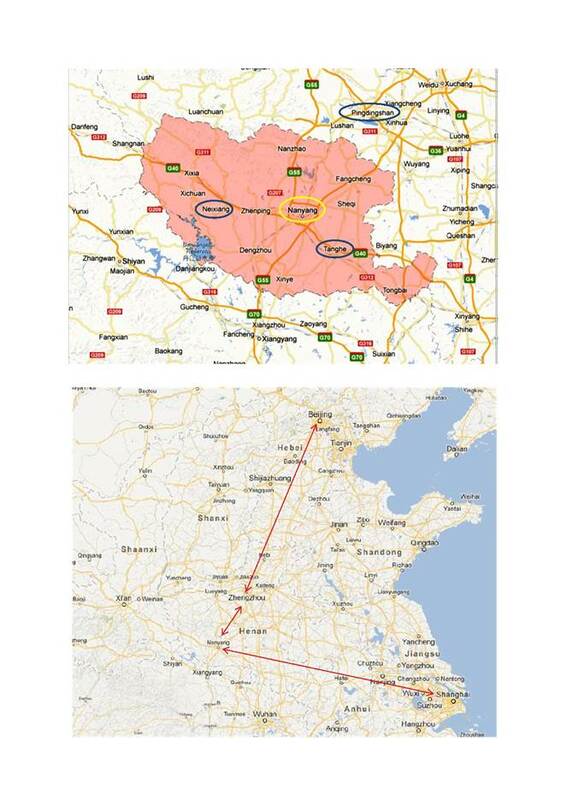 · The Delegation then travelled by bus to the city of Nanyang (population 11,000,000 in an area of 2659 sq. kilometres) to attend the opening of the Jade Festival and a formal meeting with representatives of that City. Following detailed presentations by both the Chinese & ourselves, agreement was reached to work towards future relationships. Of significance is the prominence of the centre of Wollongang in Nanyang – a point to be exploited with the presence of University of Wollongong in the shire. · The Delegation then moved to the County of Neixiang, again a County under Nanyang consisting of some 700,000 people having an area of 2,500 sq. kilometres. The delegation meeting was less formal and like Tang He County was used to assist us in understanding the rural nature of the overall Province & apart from visiting a prehistoric dinosaur site, our delegation visited a major dam and water conservation area from which water is supplied over hundreds of kilometres to Beijing and other major cities. A visit was also made to an historic Chinese Magistrates Administration Centre which has been excellently preserved. · Further informal meetings were held with deputy governor and trade chiefs from counties of Xichuan. · The Delegation then moved to Shanghai to end the visit prior to returning to Australia. Henan province has been the centre of many Dynasties, economy, capital cities and government across the history of China. The main thrust of the visit to each City and County was to alert the officials and business people to the strategic proximity of Bega Valley to Sydney, Canberra and Melbourne; the access via cruiseship and plane; the existence and prospects for growth in overseas students and youth exchanges into the shire (and with it the associated tourism of VFF); the opportunity to tap into the dairy, fish and wine product of the shire; and potential for Chinese investment in tourism accommodation and infrastructure, port infrastructure, and events. Already prospects are emerging with bridal cruises, flower sculpture and lantern events for example. This can be a beginning to establishing long term relationships between the Bega Valley and China. Council funded the cost of an interpreter $4,439 (exc GST) and the preparation of a DVD on the Bega Valley Shire and related printed material, at $4,787 (exc GST). Council also expended approximately $850 on gifts for officials. Delegates met their own travel and personal expenses. The DVD, brochures and presentations can be used for Chinese and other promotions. It is suggested a higher quality hard copy book of images of life, business, community and environment of the shire be prepared as gifts for future visits and government officials. Staff resources were taken up organising the delegation from Bega to China. Similar resources are anticipated should council host a delegation from Pingdingshan. While several delegates advanced their own business discussions with officials, the opportunity to engage with Bega Cheese, UoW and ACW into the return visits is important to expand the knowledge of the Chinese and understanding of cooperation and investment prospects. Options for mining and exportation of super phosphate from Belarus could be explored along with opportunities to set up a processing plant and export Australian beef cattle to China. While the contrast in scale, history, culture, business, economy and tourism experience between Bega Valley and the Henan cities and counties is immense, the level of interest shown to cooperate, develop relationships (trade, tourism, education) and encourage investment here, is significant. · participating in the next APEC convention in 2014. Cooperation agreements do not necessarily form a sister city relationship, as it is more focussed on business and cultural cooperation. 2. That Council receive a business cooperation delegation from Pingdingshan, and assign funds for civic reception and preparation of promotional material and gifts. Report outlining operations of, and receipt of nominations for, the Recreation and Community Access Funding Committee. In 2009, Council successfully applied for a special rate variation, to raise approximately $450,000 (indexed by rate peg) per year for sporting and recreation facilities and community access. The funds are distributed under the Sportsground and Recreational Facilities Improvement Fund (SRFIF), with the expenditure against the special rate variation reported in the Council’s Annual Report . In the context of the Question raised by Cr Mawhinney at the April Council meeting, the Recreation and Community Access Funding Committee (also known as the General Sportsground and Recreation Committee) currently operates as Council’s peak advisory body on funding sporting and recreational matters. The Committee has delegated responsibilities, including the prioritisation and evaluation of SRFIF project proposals and the recommendation of funding allocations to Council. Council resolved last October to establish a s355 Committee for the management of sporting facilities, along similar terms to the General Halls and Cemetery Committees. A report is expected to go to the next meeting. A system was established through the Funding Committee where applications were prepared by sporting, recreational or other groups proposing renewal or improvement works to council infrastructure or facilities on council or crown land. Applications stipulated the purpose of the project; source of co-contributions/in kind; reference to plans of management (where relevant); quotes; project management and safety for example, for assessment by a sub-committee and referral to the Committee. After ranking and consideration of funding balances, the Committee would make recommendations to Council. The Committee would make two or three reports to Council a year, recommending allocations up to the special variation raised in that year. A report was presented to Council late last year on those funding allocations, in the context of the proposal to allocate $150k of the rate variation to support works associated with the Pambula Sports Complex masterplan lodged at that time. It was noted a mix of special rate variation, grant and flood works was included in the schedule. · One representative from Council’s s355 Access Committee. One of the original community representative members resigned from the committee on 21 September 2010. As a result, Council resolved on 12 October 2010 to replace that position with a designated indigenous community representative. Since the committee was established, several resignations have been tendered, mainly due to members relocating away from the Shire. Currently, there are four vacancies, which include three community representatives and one designated indigenous representative. The vacancies were discussed at a Funding Committee meeting held on 5 March 2012 and it was agreed that nominations should be invited. Advertisements were included in the local media during March 2012, seeking nominations from the community. When the nomination period closed on 30 March 2012, no nominations had been received. Membership was again discussed at the last Committee meeting, held on 25 February 2013. Due to the lack of nominations received when the vacancies were last advertised, the Committee decided that current members should canvass potential candidates and invite them to nominate for the Committee. Two nominations were received. Following the conclusion of the Special Rate Variation in June 2014, the Recreation and Community Access Funding Committee will be disbanded. A role for a community committee for assessment of funding applications should the special rate variation before IPART be approved, may be contemplated by Council at that time. As the Recreation and Community Access Funding Committee currently has four vacancies, it is recommended that Council approve the appointment of the two nominated community representatives. 1. That Council note the report on operations and membership of the Recreation and Community Access Funding Committee. 2. That Council appoint (insert name) to the Recreation and Community Access Funding Committee. This report recommends that Council adopt the advice of the Bega Valley Local Traffic Committee meeting held on 1 May 2013. The Bega Valley Local Traffic Committee held a meeting on 1 May 2013, the minutes of which have been distributed separately. It is a requirement that Council formally adopt the recommendations, prior to action being taken. The recommendations were supported unanimously by the Committee. 1. That Council approve the relocation of the existing 65kmh speed advisory sign, a further 50 metres (approximately) south of its current location on the southern approach to Sandy Creek Bridge. The sign facing is to include Reduce Speed. 2. That Council approve the installation of Slippery When Wet warning signs for both the northbound and southbound lanes, in the vicinity of Sandy Creek Bridge. The sign location for the southbound lane is to be within close proximity to the southern exit off Sandy Creek Bridge. The sign location for the northbound lane is to be placed at the previous location of the 65kmh speed advisory sign. 3. 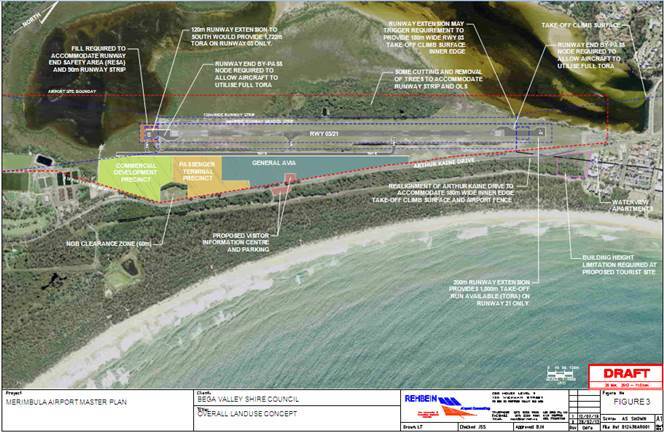 That Council approve the application of a Rhyolite reseal, commencing at the southern end of the Sandy Creek Bridge, for a distance of approximately 300 metres southward. 4. That Council approve the removal of additional roadside vegetation, to allow greater sight distance of advanced warning signs for oncoming traffic. This report outlines Council’s current purchasing procedure for passenger and light commercial vehicles and highlights the significant savings being made. In the past and again recently, Council staff have been approached by local vehicle suppliers, critical of Council’s current purchasing practices. Much of this stems from a change in approach for vehicle procurement, which was brought into effect during 2010. In the past, Council sought purchases from local suppliers, who provided vehicles at the State Government Contract price and such purchases were generally distributed amongst the local dealerships. In 2010, the process for passenger and light commercial vehicle purchases changed to a more business and price competitive approach. This included monitoring the resale market to determine the vehicle type, model and changeover period. Generally speaking, vehicles are being held for longer and make/model choices have more closely followed popular brands, based on auction pricing. Council’s purchasing approach was also changed. The State Government Contract price was no longer accepted, rather further competitive quotations were sought from at least an additional two suppliers, local and/or non-local. Although attracting criticism from some suppliers, this approach immediately realised price savings, as dealers were able to supply vehicles at 2% to 5% below the State Government Contract price. Furthermore, additional savings were made as quotations were now competitive, included non-local dealers and the selection was based on best value. By way of example, Council recently purchased 19 passenger and light commercial vehicles for a total cost of $629,590. 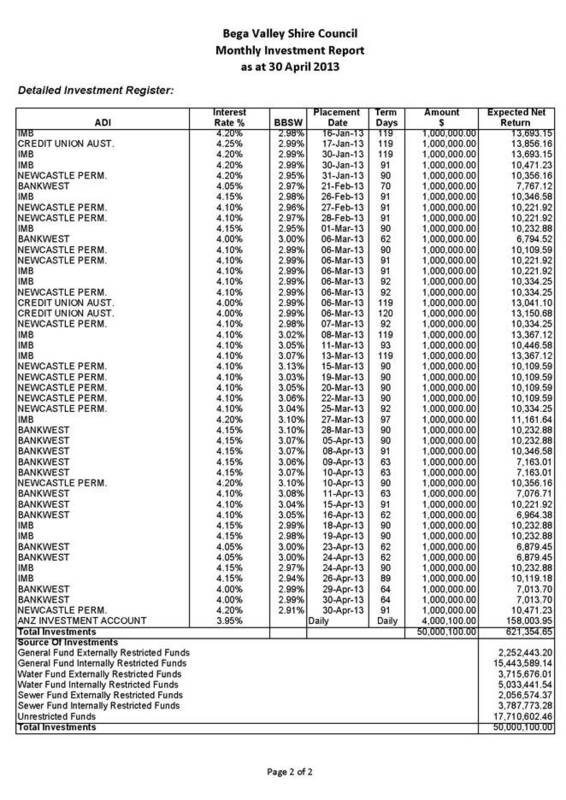 The net savings based on State Government Contract prices was 0.8% and the net savings based on best value was 7%. Therefore, Council realised some $44,000 or well over $2,000 per vehicle better than would have been achieved from previous purchasing procedures. Savings do vary significantly with quotation timing, make, model and number of vehicles being purchased. Nonetheless, the overall estimated improvement in purchasing value is over $210,000 since 2010. On the negative side this has resulted in some purchases being awarded to non-local dealers. However in the main, it is considered that the balance between local purchases and ratepayer savings has been reasonable, within a competitive market. Of the $2.9M passenger and light commercial vehicles purchased, the mix between local and non-local has varied between 80%-90% local to 20%-10% non-local. Passenger and light commercial vehicles are purchased in accordance with Council’s procurement policy and the Local Government Tendering regulations. While vehicle purchases are based on best value and resale value, environmental issues are also considered so that 4 cylinder and diesel vehicles are preferred. Recent purchases have also included hybrid vehicles. Given the geographic nature of the Shire and the distances required to travel, it is difficult to see an alternative to the car in the foreseeable future. The vehicles form part of Council’s light fleet, comprising of 69 commercial and 52 passenger vehicles that play a vital role in Council’s service delivery. The annual replacement program is currently based on three years or 90,000km, but this will vary according to resale value, vehicle type and model. The current purchasing approach means that local dealers are not guaranteed orders, therefore this may result in some pressure on the local economy. However, this does encourage and provide for a competitive marketplace, as well as maintaining the repair, spare parts and servicing sectors. There are significant financial gains for ratepayers in the current procurement process. The overall improvement in purchasing value varies between 2%-7% and is estimated to be over $210,000 since 2010. A number of Council’s workshop and finance staff are involved in the documentation, monitoring and procurement of plant and vehicles. The current procurement approach it consistent with the projected service savings identified and brought to account in Council’s Long Term Financial Plan. The supply and delivery of passenger and light commercial vehicles is in accordance with Council’s procurement practice. Purchases are assessed on the basis of providing best value and this approach has realised significant savings for the Bega Valley community. The procedure of obtaining three quotations, including the State Government Contract price from both local and non-local suppliers has resulted in savings of up to 7% on vehicles. Such savings form part of the adopted Long Term Financial Plan and are integral to maintaining a prudent and financially sustainable budget and thereby limit the extent of special rate variations. That Council endorse the current procurement practises for the purchase of passenger and light commercial vehicles and note the significant savings realised as a result of best value and the competitive approach taken. This report outlines the background for the Bega Civic Centre and details the outcome of the evaluation of the Design and Construction Tender RFT 59/12 for the Bega Civic Centre and recommends award to the preferred tenderer. · complete demolition and construction of a new building on the current site. A consensus was for a multi-function community meeting place, including a flexible mix of auditorium, meeting rooms and kitchen that will meet future social and cultural and more importantly, technological needs; and to demolish the existing 50 year old facility and design a new building on the current Town Hall site in Zingel Place. The Functional Brief for the Bega Civic Centre, rationalising and consolidating these expectations and requirements of Council and the community, was adopted by Council on 16 March 2010. Having virtually unanimous community support, the Brief specified the functional requirements of the Bega Civic Centre, to be located on the current Zingel Place site (noting alternate sites was explored and reported separately to Council). Following consideration of expressions of interest and invitation to next stage tenders in 2012, Council approved the calling of Design and Construction Tenders, based on the Functional Brief, as amended, on 21 November 2012. “1. That Council approve the invitation to tender for the demolition, design and construction of the Bega Civic Centre from Edwards Construction, National Buildplan and Hines Construction, noting a Development Application is required. • Removal of pedestrian access between the BVSC staff car park and Zingel Place. • Catering capacity be reduced to 350 people in line with serving capacity. • The building meet BCA environmental sustainable provisions. Design and Construction Tenders 59/12 for the Bega Civic Centre Redevelopment were received from the three pre-selected companies. All three tenderers developed a demolish and rebuild proposal, with partial retention of the existing floor and steel structure elements, having been offered refurbish or rebuild options. All parcels are zoned 3(a) and there are no known land title, ownership or zoning impediments to the proposed Civic Centre. On 6 September 2011, Council determined to employ a three stage Expression of Interest (EOI) and Design and Construct Tender process, based on the approved Civic Centre Functional Brief, with a $5,500,000 budget. Stage 1 Expressions of Interest (EOI) closed on 29 May 2012, with 16 substantial EOI’s received. After evaluation, involving Council’s appointed community reference panel, 5 companies from the 16 were invited by Council to develop schemes. These Stage 2 submissions were received on 4 September 2012. From the five schemes, three were shortlisted, again with the endorsement of the community reference panel, to submit Design and Construct Tenders. One shortlisted Tenderer subsequently withdrew, due to being overcommitted and was replaced by the next best Stage 2 submission, as per Council resolution of 16 January 2013. Three Design and Construct Tenders were received on 20 February 2013 and after post Tender clarifications, all came in under Council’s budget limitation. All three Tenderers had prequalified in terms of capability. An extensive and lengthy consultation process has taken place to determine and reflect community expectations and requirements. The consultation process included a large community meeting on 23 June 2010, attended by at least 80 members of the public. The main options, including refurbishment of the existing facility, alternative buildings/locations and a new building on the current Zingel Place site, were considered. The overwhelming majority at the meeting endorsed a new building on the Zingel Place site as the preferred option, which forms the basis of the Civic Centre Functional Brief. Numerous meetings were scheduled between 17 August to 7 September 2010 with a wide variety of community and focus groups including: Bega and Eden High Schools, Mumbulla School, Bega TAFE, Illawarra Institute, fLING dance company, local orchestras and choirs, Bega RSL, Bega Chamber of Commerce, Town Hall Committee, Four Winds Festival, Bega Regional Gallery, Candelo Arts Society and community groups from Bermagui, Merimbula, Eden and Candelo. Subsequently, on 21 September 2010, Council reviewed a range of relevant issues, including the then BVSC 20 year plan and formally determined to proceed to invite Expressions of Interest, based on the endorsed Civic Centre Functional Brief. Following this, a series of formal community and stakeholder meetings attended by Councillors, senior BVSC staff, appointed community representatives and stakeholder groups took place from 27 October 2010 to 22 June 2011. Included among the stakeholders in particular was the Civic Centre Action Committee. Council determined the budget for construction at $5,500,000 on 14 June 2011. This budget limitation, originating from over two years ago and reconfirmed at subsequent Council meetings on 26 July 2011 and 6 September 2011 will prove a challenge, given the Functional Brief requirements and community expectations in 2013. It should be recognised that the original estimates for this facility in 2009 (based on Taylor deAngelis concept design at the time) were over $10,000,000. While refurbishment and rebuild options were canvassed, through the Functional Brief and scope rationalisation process, the budget was reduced to $6,500,000, which was then further decreased to $5.5m at the June 2011 meeting. Factors putting further pressure on the budget include the Building Price Index (BPI), which has escalated at an average of 6%pa since 2009 and will equate to a cost increase for the project of approximately $700,000. To meet Council’s $5,500,000 budget, all three tenderers reduced scope and inclusions and adjusted specifications. The tendered prices generally do not include: supply of auditorium chairs, furniture, drapes, extension of time costs beyond the nett program stated in the tender offer, stage curtains, services connections and upgrades, audio-visuals, costs for construction power and water and any risk involved in the incorporation of the existing building structure and floor. Council had previously envisaged the furniture and audio visuals could be the subject of grant applications. · $2.5 million from current asset reserves and roll over of existing loan funds. The Preliminary Business Case is included as Attachment 4. From the extensive consultation that has taken place, the community has confirmed both an identified requirement and an expectation for a new Civic Centre in Bega. The subsequent EOI and Tender process, based on the approved and amended Functional Brief, has identified the quantum cost to meet the minimum community requirements. All three tenderers developed a demolish and rebuild proposal, with partial retention of the existing floor and steel structure elements. A Design and Construct Contractor with the capabilities to achieve that end has been identified. On the basis of best scheme and value for money, it is recommended that a preferred tenderer be awarded the 59/12 Design and Construction of the Bega Civic Centre Redevelopment contract. It is also recommended that the provisional allocation of $1,565,000 funding to adequately cover escalation and the specification and risk shortfall be considered. 1. That Council accept the tender from (insert) in relation to Contract 59/12 Design and Construction of the Bega Civic Centre Redevelopment, for the Contract sum of $5,546,233 plus GST and with provisional/variations allowance of $1,565,000. 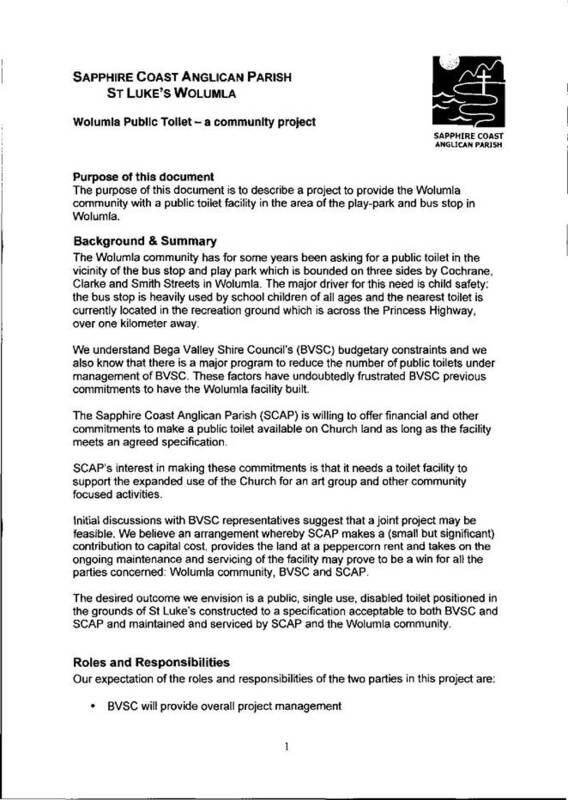 Report prepared to update Council on the Wolumla Public Toilet proposal, following the completion of design and receipt of a formal proposal from the Sapphire Coast Anglican Parish. Accordingly, Council officers met with representatives of the Sapphire Coast Anglican Parish (SCAP) to discuss the project and a detailed design and cost estimate was prepared for SCAP consideration (attached). SCAP believe that the community of Wolumla need a public toilet facility and that the church land, which is located near the public reserve and bus stop is an appropriate location. 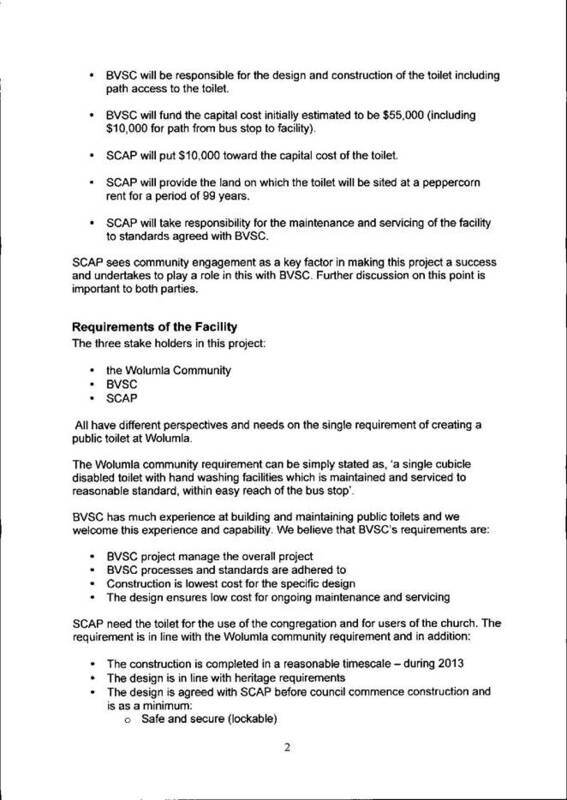 For its part, SCAP would like a toilet on their land, adjacent to the church building, to provide facilities for the church and proposed extended uses. 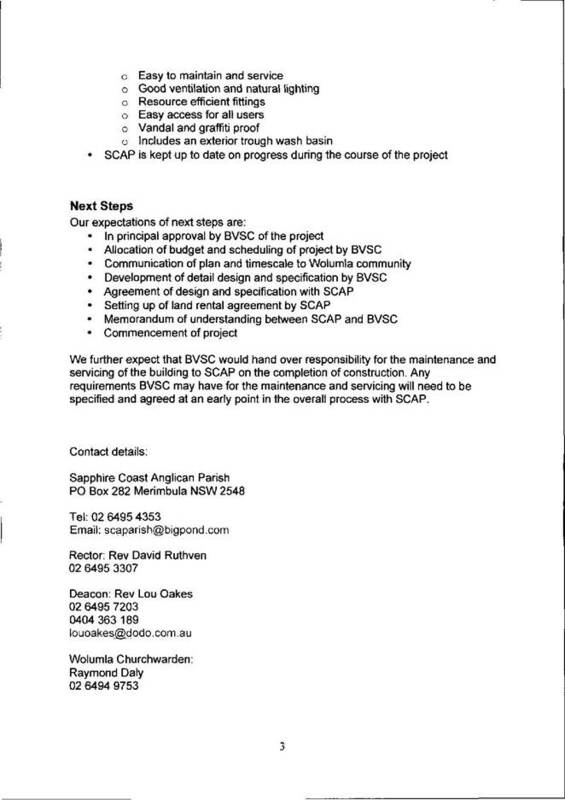 On the 17 April 2013, Council received a formal proposal from SCAP (attached). 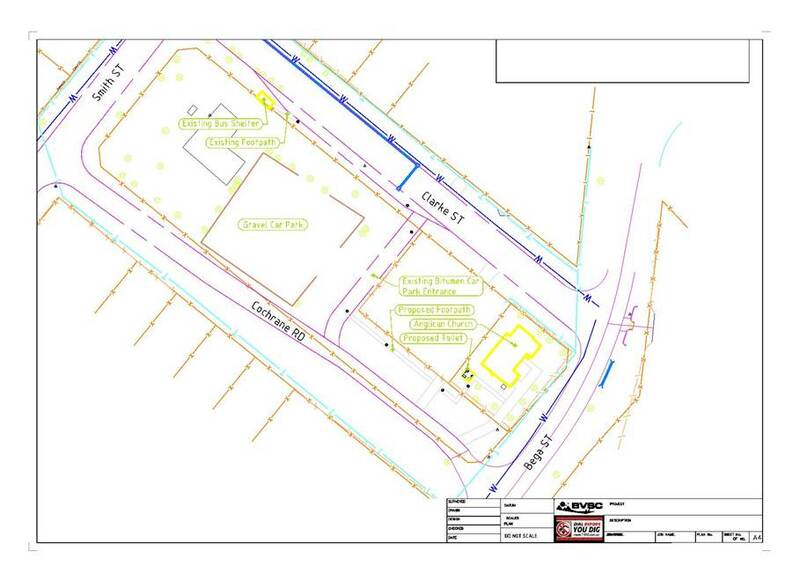 · That Council build a single disabled unisex toilet on parish land at the corner of Cochrane and Bega Streets, Wolumla, at the estimate cost of $55,000. · SCAP would provide a long term, peppercorn lease of the land, maintain the facility as a public toilet and provide a capital contribution of $10,000 towards the construction. Construction of the public facility would be on private land and therefore appropriate long term lease documents would be required to secure public tenure into the future. Also, formal maintenance, repair and operating agreements would need to be in place. SCAP have agreed in principle to the need for such agreements. As Council is aware, the adopted Recreation Asset Management Plan incorporated asset rationalisation as a key element to long term asset and financial sustainability. More recently, Council approved the toilet rationalisation program. Inclusion of another toilet asset is contradictory to this program, although the proposed facility would be maintained and operated by SCAP. The need for the facility is not clear and its proposed location is not directly linked to the criteria set out for the siting of public toilets. While being near the public reserve, it is not at the reserve nor is the site in a highly public visible area. This to some extent can be overcome by signage and the construction of a concrete footpath. 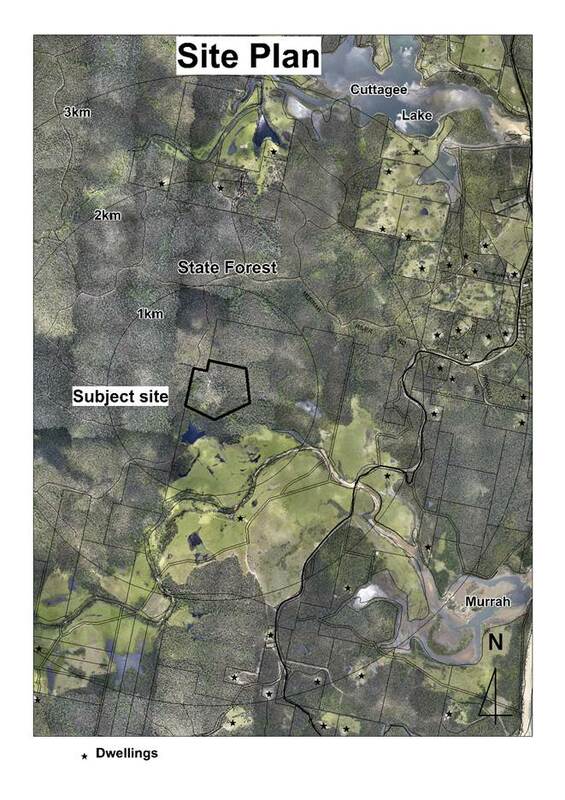 There is also an adjoining residential property between the public reserve and the proposed site. Apart from discussions with SCAP, no public consultation has taken place. The cost to Council is estimated to be $45,000 and no budget provision has been made for this expenditure. Should Council wish to proceed, then another recreation project would not proceed, be deferred or funds would have to come from asset reserve. The provision of a public toilet at Wolumla at the intersection of Cochrane and Bega Streets is contrary to Council’s current toilet rationalisation program and principles adopted in the Recreation Asset Management Plan. The proposed site has advantages in terms of operation, maintenance and church utilisation however, is not directly located in the public reserve and will require signage and a concrete footpath to provide public visibility. That Council make a determination. · Income Progress graphs: These graphs illustrate how each function is progressing with their revenue estimates. The overall graph illustrates the cumulative progress of the function, while the monthly graph shows progress month by month. · Reserves table: This tables outlines cash reserves that are linked to that particular function and their movements throughout the financial year. · Expense Progress Graphs: These graphs illustrate how each function is progressing with their expenditure estimates. The overall graph illustrates the cumulative progress of the function, while the monthly graph shows progress month by month. · Grants Received table: This table shows the name and value of each specific purpose grant that that particular function has attracted. · Revotes Table: This table tracks the progress of the revotes from the 2012 financial year. The next evolutionary step for this report is to incorporate the Community Strategic Plan operational deliverables into the theme summaries, with reference to the budget and the tracking of their respective financial information. Council staff retain the ability to enquire, transact, and report on the detailed General Ledger, including budgets. If there are specific questions relating to detailed transactional information, staff can provide answers to those questions. The QBRS reports the detailed variances for the March 2013 quarter. In summary, Councils budget position is healthy. There are a number of variances within the QBRS document which net to zero. The overall movements are favourable with a net reduction in the draw from reserves of approx. $266,000. There are no major or significant variances to report to Council. A more detailed analysis is located within the QBRS attachment. As at the end of March 2013, Council held $59,243,534 in cash & investments – the bulk of which remain restricted for use with planned infrastructure or projects preconditioned by loans, grants or development contributions. Revotes and attraction of grant revenue is tracking well against budget. As per Council’s policy, the QBRS reflects the budget in a balanced position and maintains working capital at adopted levels. All net movements are factored through the movement to and from reserves, including anticipated transfers to asset, ELE and property reserves at year end. Council’s March 2013 QBRS has been presented to Council. Council financial performance is healthy and within the operating budget set by Council at June 2012. 1. That Council note and endorse the March 2013 Quarterly Budget Review Statement. 3. That Council place the QBRS for March 2013 on its website for public information . To report the details of Council’s investments during the month of April 2013. In addition there is $1,975,445 in uninvested funds in Councils operating account. Council is required to exhibit its Community Strategic Plan – Bega Valley 2030 for a period of 28 days. All councils in NSW are required to develop long term, medium term and short term plans under legislative requirements, the Local Government Amendment (Planning and Reporting) Act 2009 which transitioned councils to the Integrated Planning and Reporting (IP&R) Framework. This new framework aims to encourage councils, the community and other organisations to work together to plan for the future in an efficient and collaborative manner. The Community Strategic Plan – Bega Valley 2030 establishes the ambitions of the people who live, work and visit the Bega Valley. Bega Valley 2030 outlines a sustainable direction for the future for the Council and community to work towards over the next 20 years. The Community Strategic Plan – Bega Valley 2030 was developed through extensive consultation with community and agencies throughout 2010. The Plan (and the associated Delivery Plan and Operational Plan) delineate the role Council plays in advocating, facilitating, providing or regulating infrastructure and services. Results of the community satisfaction survey were reflected through the development of the 2013-14 Operation Plan and lodgement of the Special Variation proposal to IPART in March 2013. 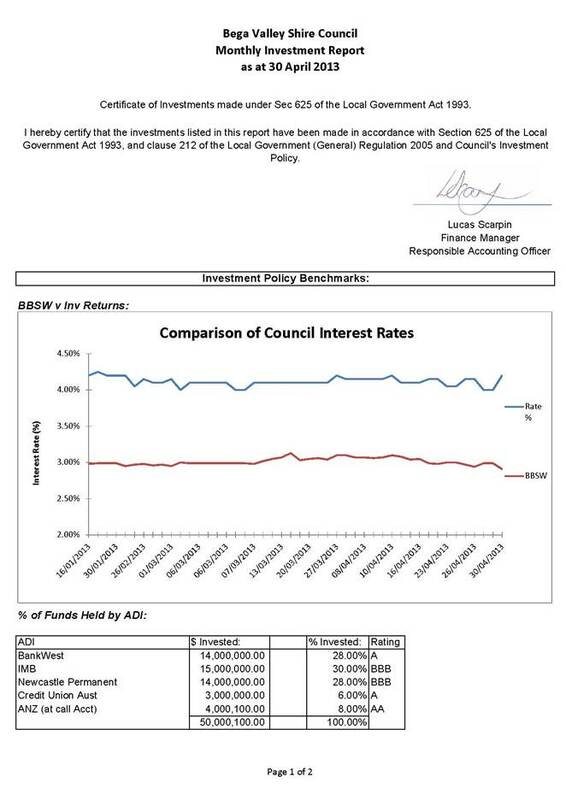 Council noted that should IPART not approve the rate variation in full or part, that would trigger a review of the respective asset management plans and long term financial plan, in turn modifying the asset standards, priorities and proposals for each town. Minor amendments have been incorporated into the Bega Valley 2030 document to enable better reflection of the community ambition and clarity in communication. These amendments are in alignment with communication style of the draft 2013 – 14 Operational Plan, enabling consistency across the suite of documents. Council is required under the Local Government Amendment (Planning and Reporting) Act 2009 to exhibit the Community Strategic Plan for a period of 28 days prior to June 30 following the Council election. The exhibited draft Plan contains edits and reshapes into a format that delineates the directions into actions per Theme. It will be html and pdf enabled. The proposed draft does not include Council’s adopted position statements as Councillors have indicated a need to refresh these in line with the current review of policy. When this review is finalised, the redrafted and new position statements will be publicly exhibited at that time for insertion into the community strategic plan. Similarly, recent DLG guidelines on performance reporting has required changes to indicators in the performance framework in the CSP. These are expected to be published in July/ August 2013. The Bega Valley 2030 is the community aspiration document, providing the guiding framework for the Community Strategic Plan suite of documents. Amendments made are in response to feedback from DLG, but have maintained the direction of the community feedback through the extensive consultation period in 2010, and have further enhanced key areas as raised through the community satisfaction survey conducted in 2012. This review has enabled consistency in communication throughout the suite of documents in alignment with Council’s draft Communication Strategy. Councillors have been workshopped and provided a draft copy under separate cover. That the proposed amendments to the Community Strategic Plan – Bega Valley 2030 be placed on public exhibition for the period of 23rd May – 19th June 2013. The NSW State Government has passed the “Game and Feral Animal Control Amendment Act 2012” to allow volunteer amateur hunters to kill feral animal in the State’s national parks, nature reserves and conservation areas. South East Forests and Wadbilliga National Park, in Bega Valley Shire, are affected by this legislation. Tourist visitation may well decline, especially amongst walkers and campers. Tourist and locals (including national park employees and forestry workers) may well perceive all national parks, reserves and the like are open to unsupervised recreational hunting. Feral animals dispersed by amateur hunters make it harder for professionals to do their job. Council has received correspondence from members of the community, following a protest held, in Bega seeking Council’s support in opposing the hunting in national parks. They were advised that Council has not adopted an official position on the matter. That Bega Valley Shire council write to the Premier, the Minister for the Environment and the Member for Bega to request that all national parks, nature reserves and state conservation area in the Bega Valley Shire be protected from amateur hunting due to the increased risk to public safety, the high number of visitors and the importance of nature related tourism to the shire’s economy.